Whether you call it Imposter Syndrome, negative self-talk, the Fraud Police, or any other name, the fact remains: everyone experiences self-doubt and inner judgement at some point in their lives. 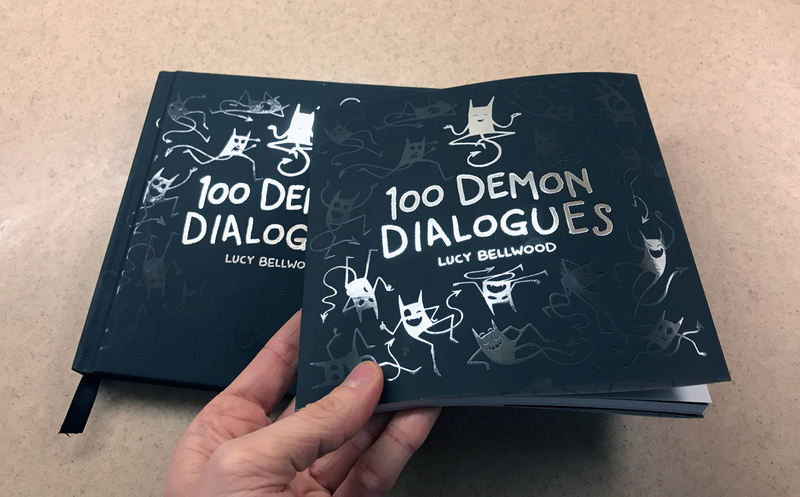 100 Demon Dialogues is a humorous, heartfelt book full of conversations between me and my pesky Inner Critic, all designed to demystify where this voice comes from and why on earth it’s so hard on us all. The book is out now! 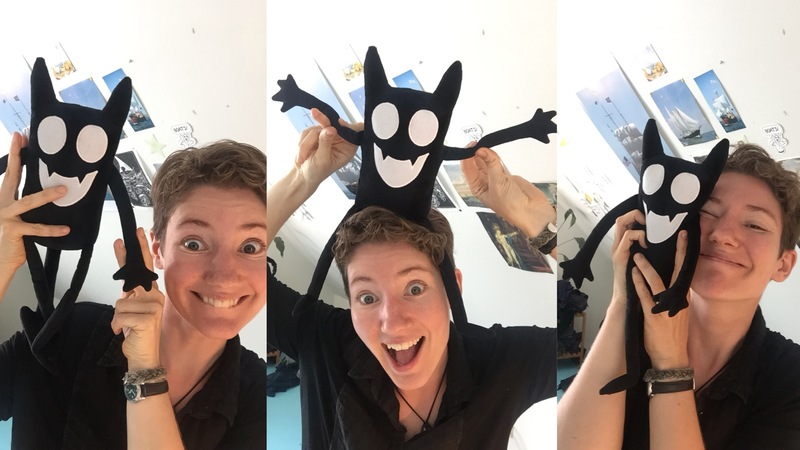 You can buy books, demon plushies, postcards, stickers, and prints of any entry in my online shop! If you’d like to support an indie bookshop, grab a copy from Powell’s, or find your nearest establishment on IndieBound. Digital editions are also available on Amazon, iBooks, and Gumroad. This collection is the culmination of my second 100 Day Project. 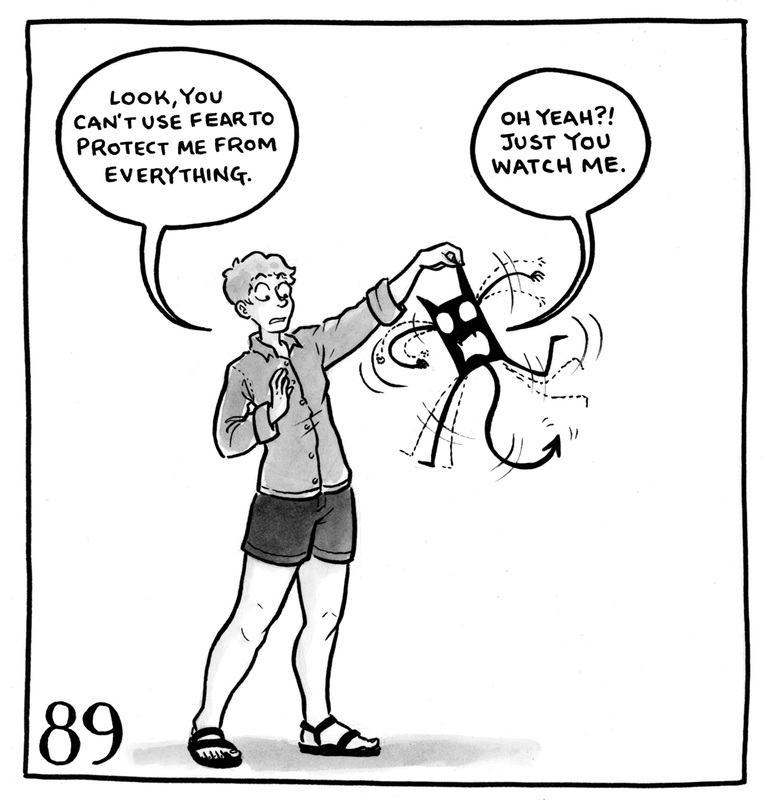 (You can check out the result of my first, A Life in Objects, here). All the entries were drawn, one per day, over the course of 100 consecutive days in 2017. It’s a process I highly recommend to folks who enjoy structure and a solid creative challenge. The demon is smiling as it walks in with a hat on its head and a suitcase in its hand, talking to Lucy, a woman with short curly hair. The demon says, "Hah, see? You can't live without me!" Lucy replies, "No, I've figured out that you only shut up when I talk about you. It's different." 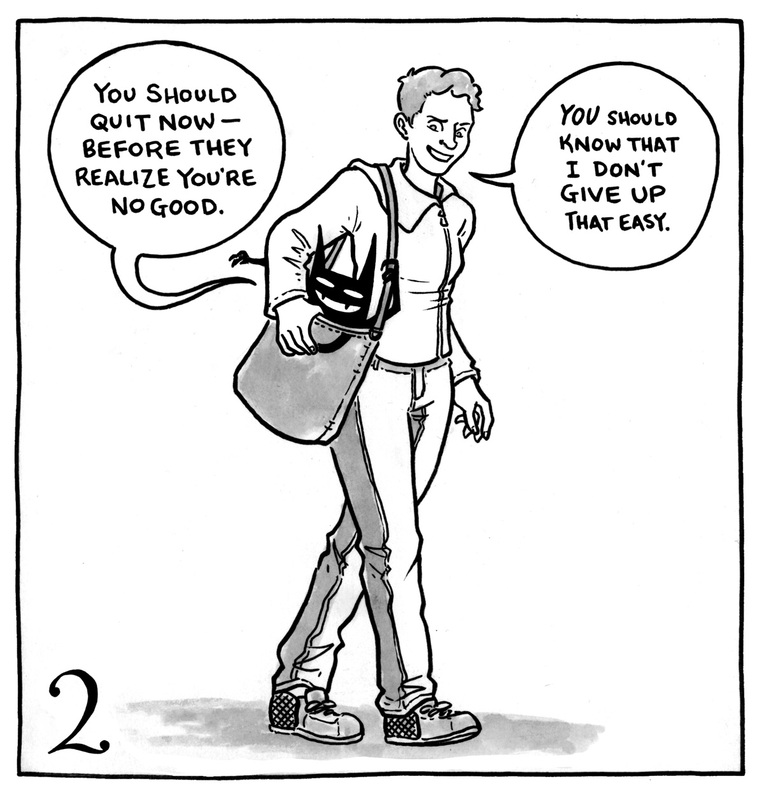 Lucy is walking while the demon sits in her shoulder bag and smiles up at her, saying "you should quit now--before they realize you're no good." Lucy says, "You should know that I don't give up that easily." 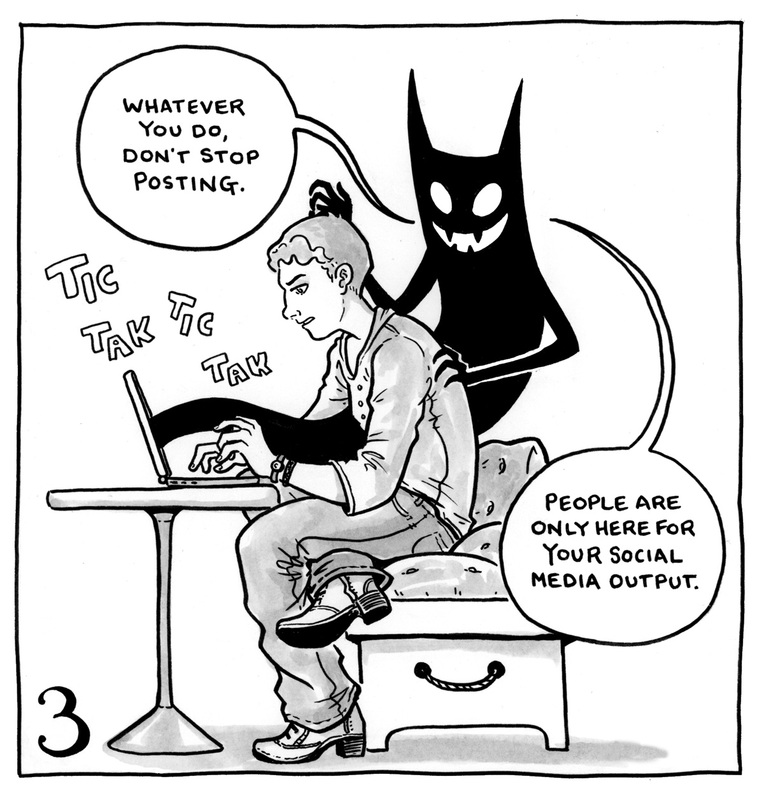 Lucy is typing at her computer while the demon looms over her shoulder. It says "Whatever you do, don't stop posting. People are only here for your social media output." The demon clings to Lucy's jacket, saying "Stop being vulnerable, you're making yourself a target!" Lucy says, "We have to talk about what hurts." The demon sits on top of Lucy, pinning her to the ground. It says, "it's me, your inbox!" Lucy glares at it while twirling a party twirler. She flatly says "Hooray." Four demons stand on top of each other, with microphones in their hands. Lucy is wearing a housecoat and carrying a steaming mug. The demons ask, "What's your next project? When are you fixing your website? What pen do you use? Do you currently need more toilet paper?" Lucy says, "Jesus Christ I JUST got up--give it a rest." 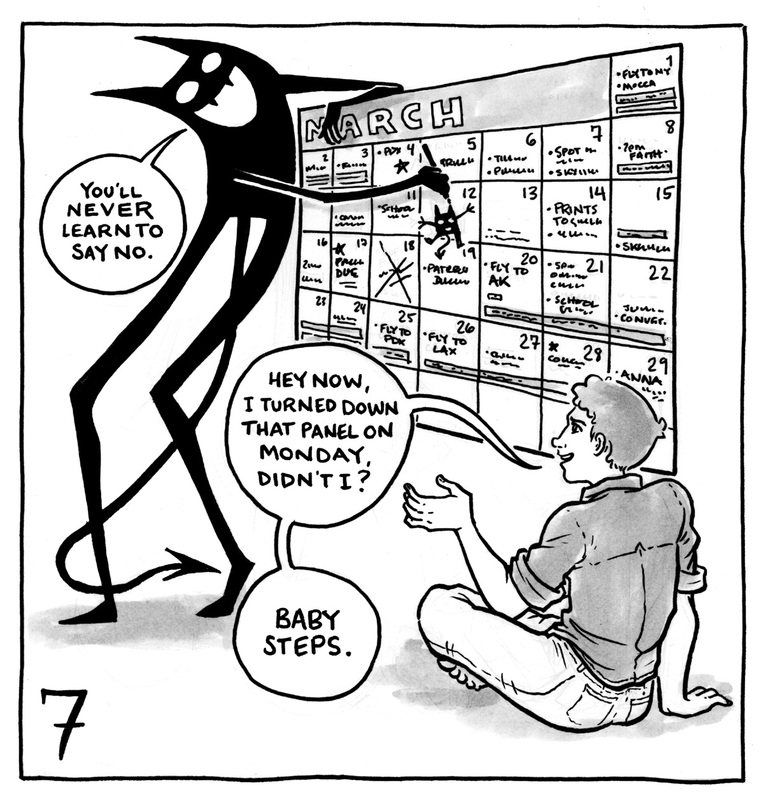 The demon looms over a large calendar full of commitments, saying "You'll never learn to say no." Lucy says, "Hey now, I turned down that panel on Monday, didn't I? Baby steps." The demon is running while Lucy sits crosslegged with a pot of tea. The demon is panicking and saying, "You said 'no' TOO MUCH we're going to die destitute and alone!" Lucy says, "well, I don't know what I was expecting." 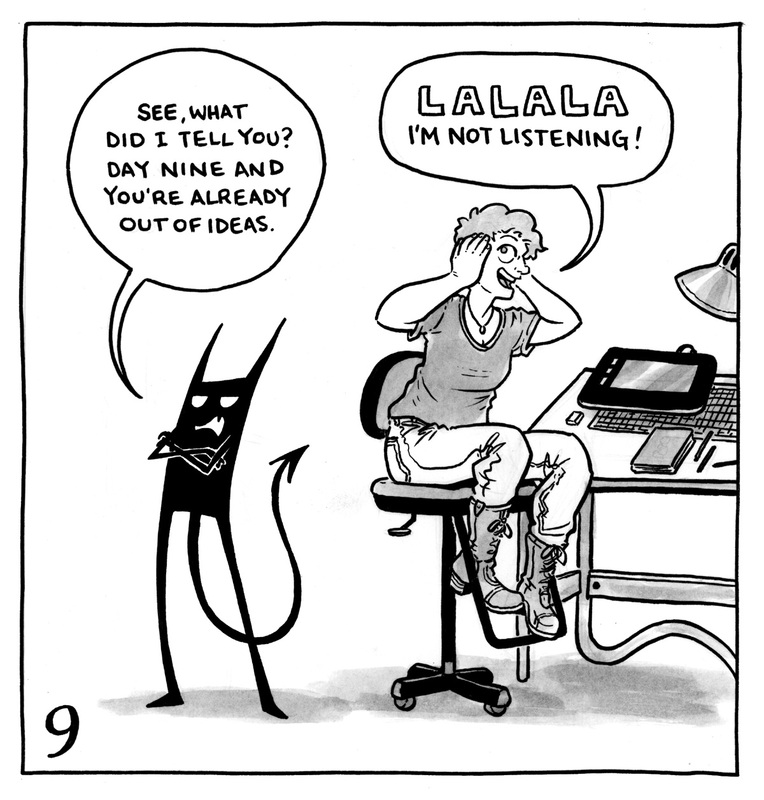 The demon stands with its arms crossed while Lucy sits at her desk with her hands over her ears. The demon is saying, "See, what did I tell you? Day nine and you're already out of ideas." Lucy replies, "LALALA I'm not listening!" The demon stands beside Lucy, who is lying on the floor surrounded by broken plates and sticks. 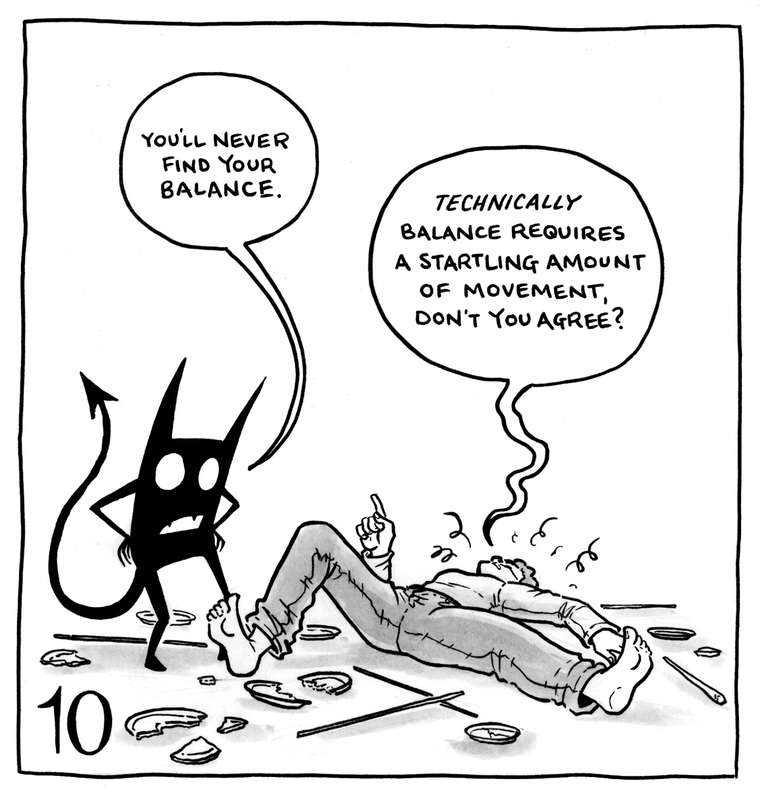 The demon says, "You'll never find your balance." Lucy says, "TECHNICALLY balance requires a startling amount of movement, don't you agree?" Lucy is looking at her phone, distressed at the news, which is filled of war and violence. The demon looks over her shoulder and says "What if we can't stop it?" The demon is lounging with sunglasses and a drink while Lucy is looking intensely at a complicated string of circles and lines. 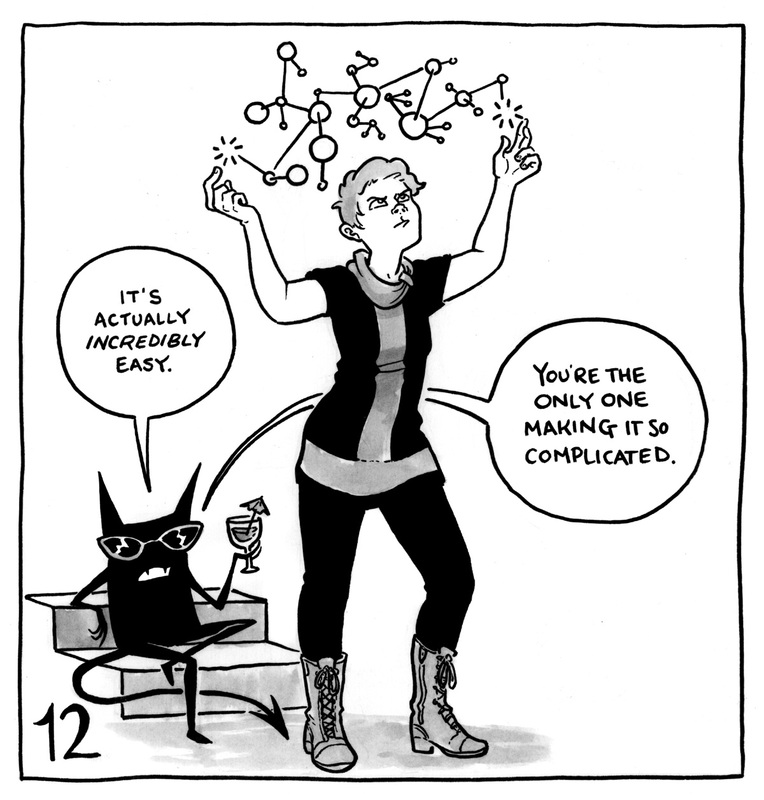 The demon says, "It's actually INCREDIBLY easy. You're the only one making it so complicated." 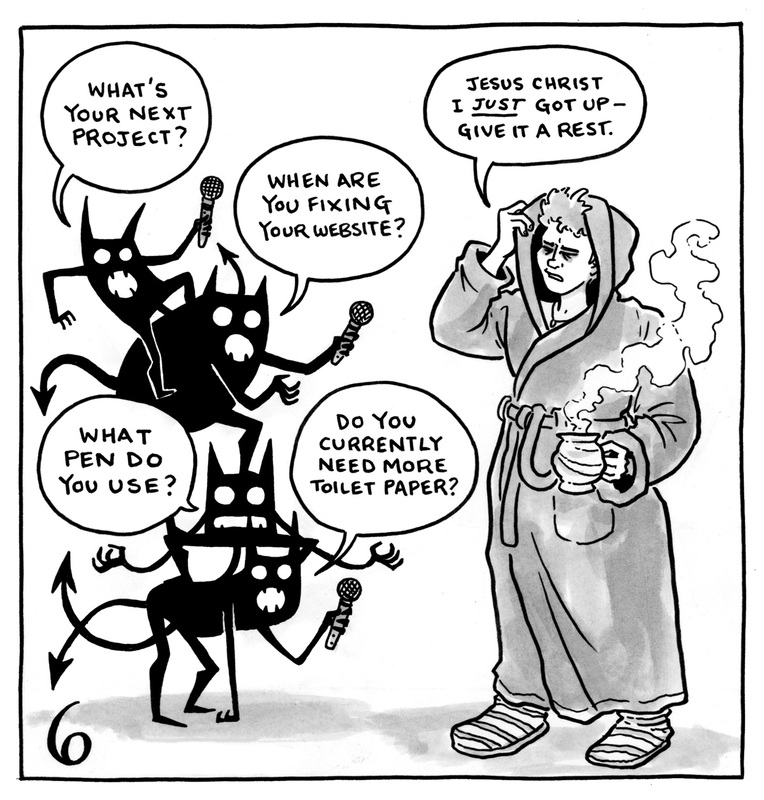 The demon is holding an application for a project that says "Deadline Today!" while Lucy walks away. 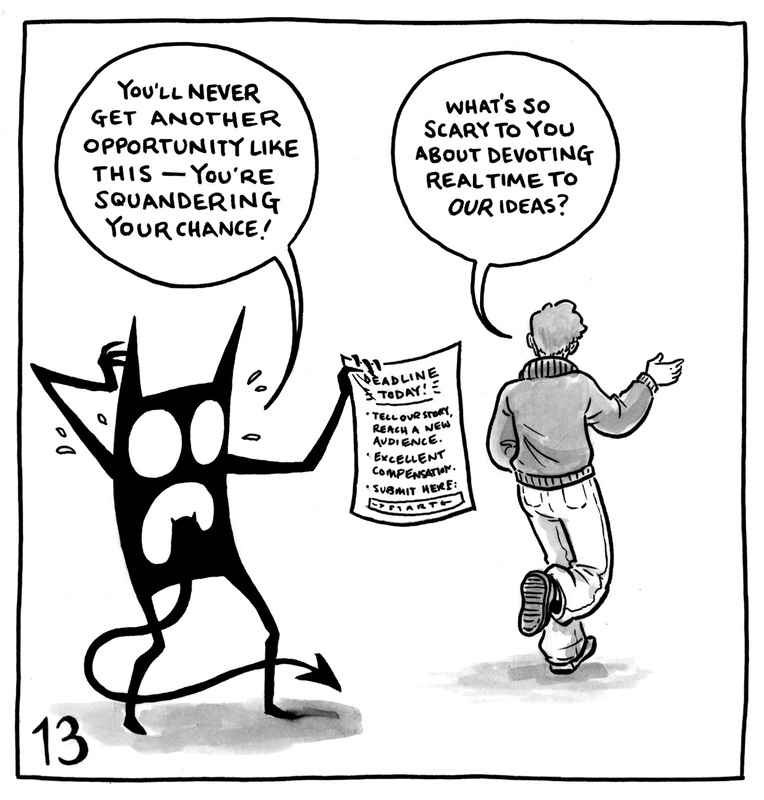 The demon says, "You'll never get another opportunity like this--you're squandering your chance!" Lucy says, "What's so scary to you about devoting real time to OUR ideas?" 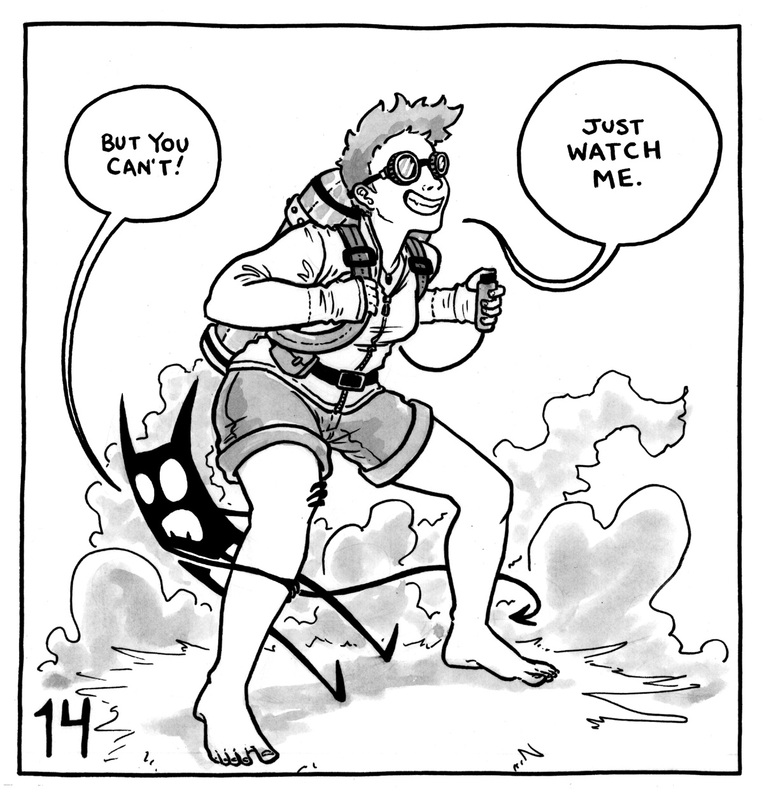 Lucy is wearing goggles and a jetpack that has steam emanating from it. The demon clings to her leg and says, "But you can't!" Lucy says, "Just watch me." The demon is lying facedown over a bench beside Lucy. The demon says, "Augh it's all hopeless!" Lucy asks, "Do you wanna...talk about it?" The demon says, "...maybe." Lucy is leaning over her luggage, the demon sitting on top of her. 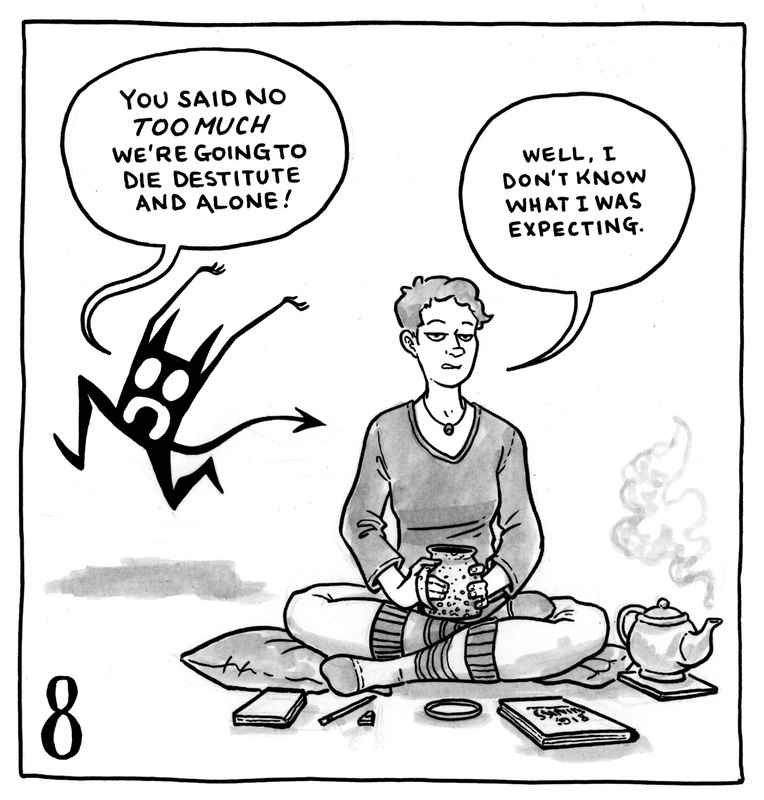 The demon says, "Face it, you're always going to be a neurotic mess about travel." Lucy says, "But I did finish packing a whole day early. That has to count for something, surely." 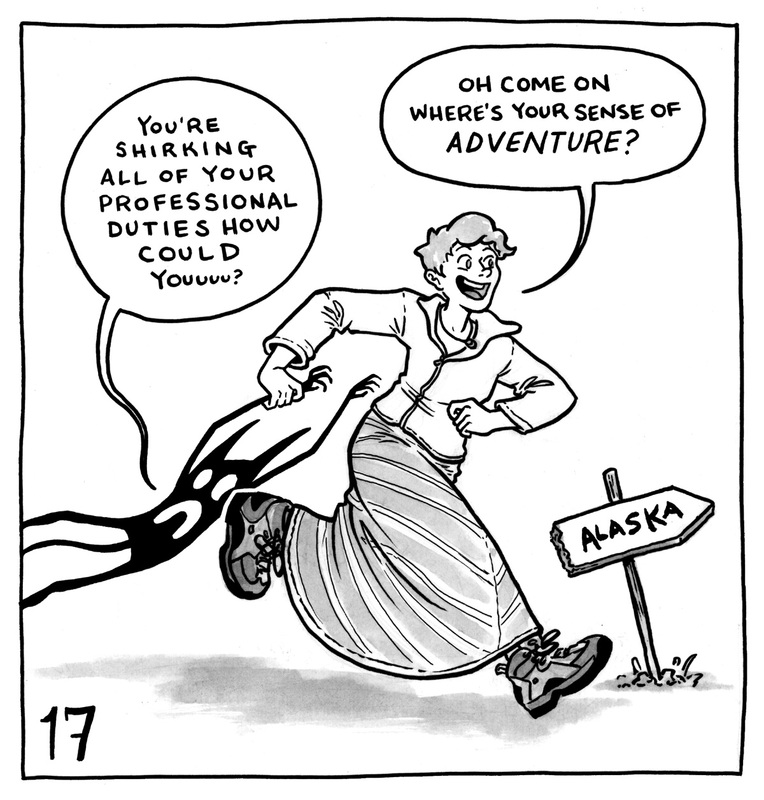 Lucy is running in the direction of a sign that says "Alaska" while holding onto the demon. The demon wails, "You're shirking all of your professional duties, how could you?" Lucy says, "Oh come on, where's your sense of adventure?" Lucy is standing looking at eight demons that hang off of her hands. The demons say "This thing! Me now! My turn! Me! No, me! This! Wait, but also this! Ooh also me!" The demon stands and yells to Lucy, who is off panel. The demon hollers, "Just so you know I'm having TONS of fun without you." Lucy says, "Pipe down, I'm watching the Northern Lights!" Lucy sits in a chair while the demon floats by her shoulder. The demon says, "They're all so amazing. There's NO WAY we belong here." Lucy says, "I hate to break it to you, but we ABSOLUTELY do." The demon is melting into a black puddle. It yells, "stop having such a nice time!" The demon stands on a small stage with a hat and cane. Lucy is wearing a fuzzy hat with ears that is pulled down over her eyes. 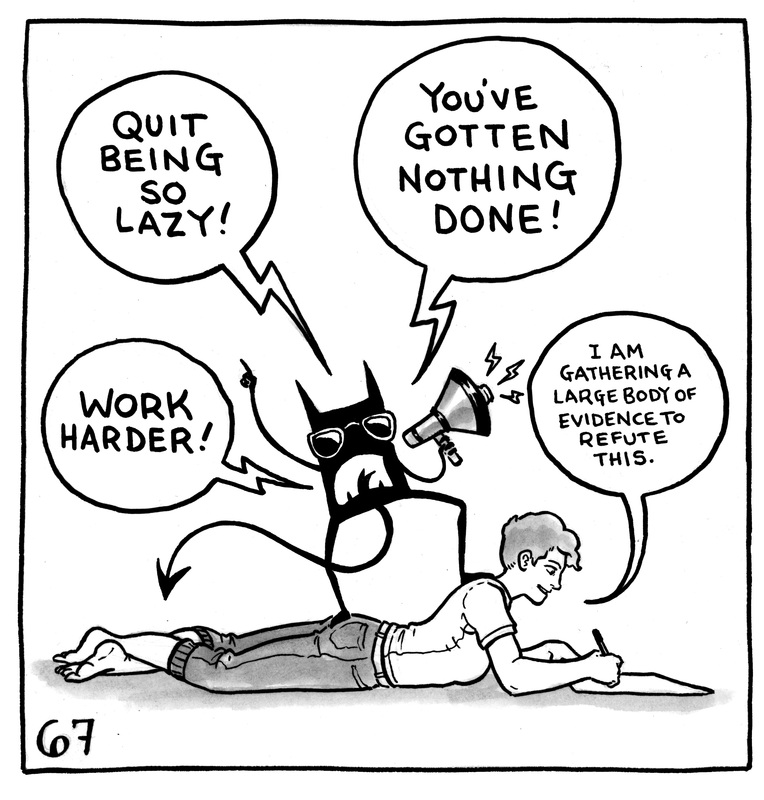 The demon sings, "DEADLINES!" Lucy says, "Not till the camp hat comes off, you miserable wretch." Lucy sits reading while the demon glares at her through a window. The demon says, "You're a day behind." Lucy says, "Uh-huh. 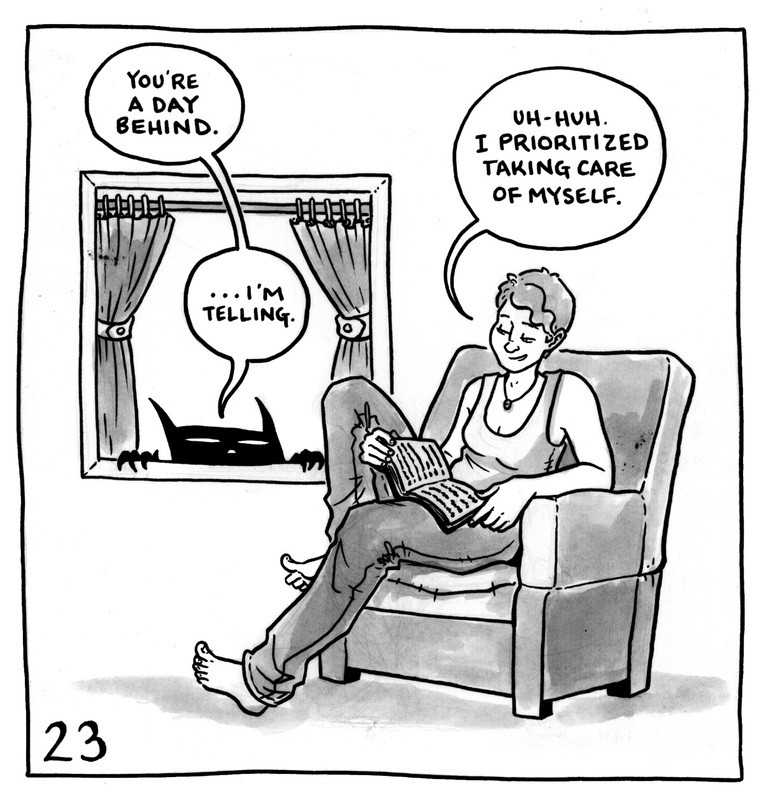 I prioritized taking care of myself." The demon says, "...I'm telling." Lucy looks at a view of mountains and wilderness. 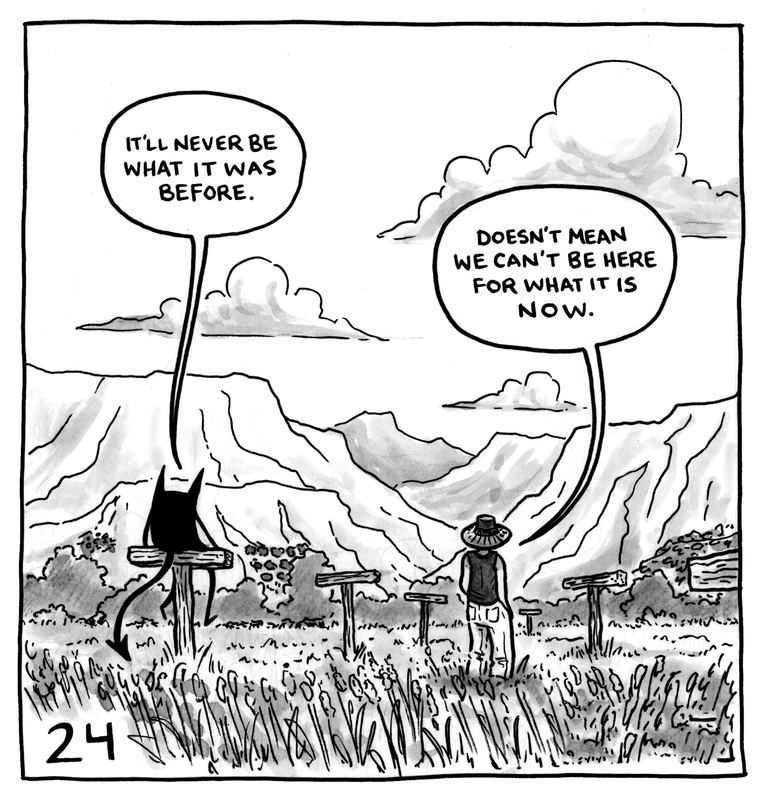 The demon says, "It'll never be what it was before." Lucy says, "Doesn't mean we can't be here for what it is now." The demon is shouting into a megaphone. Lucy stands atop a pile of paper. 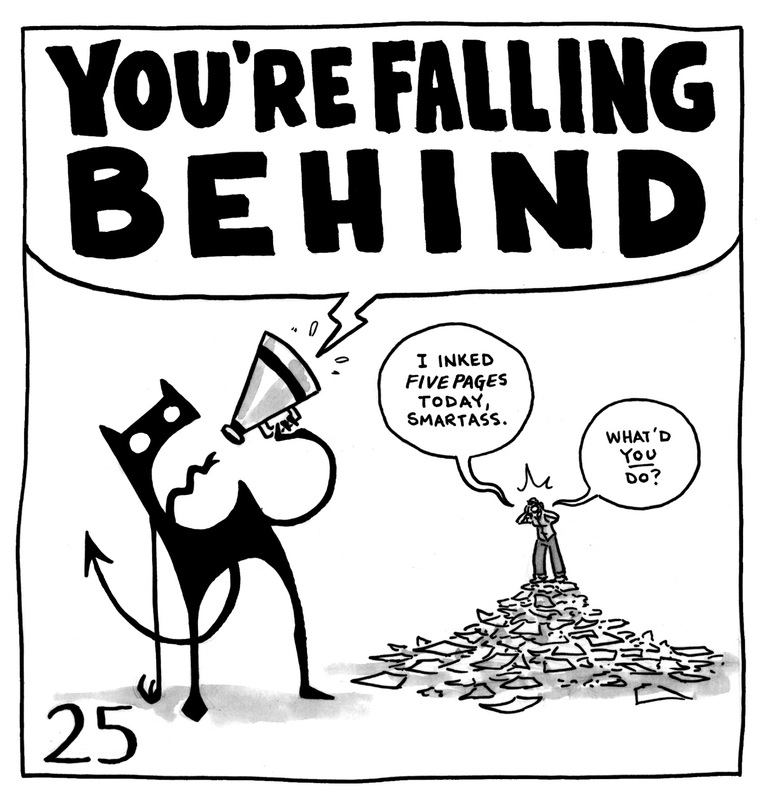 The demon yells, "YOU'RE FALLING BEHIND!" Lucy says, "I inked five pages today, smarty. What did YOU do?" Lucy is at a picnic with a crowd of people. Three demons sit on a bench. 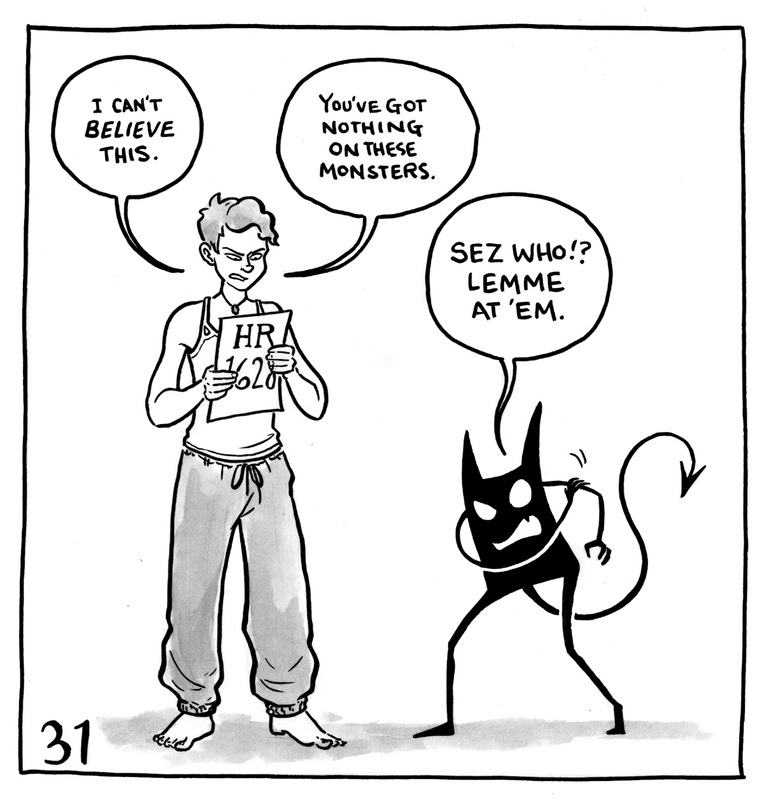 The demons say, "People only care about your interesting job!" "Everyone can tell how desperate you are for connection!" "You don't know how to make friends!" Lucy says, "You guys are the worst plus one." Lucy is holding her demon, which is crying on her shoulder. The demon wails, "there's just so much and it NEVER stops and we can't fix it all and, and, and--" Lucy says, "Shh, shh I know. You're overtired. Let's go get some sleep. Come on." 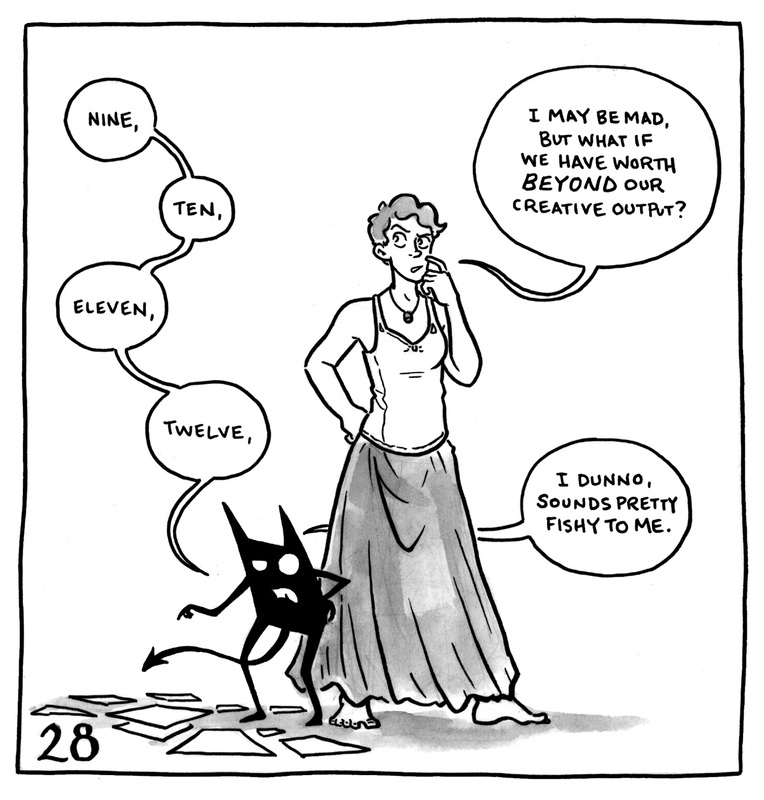 The demon counts pages of art, saying "Nine, ten, eleven, twelve," Lucy says, "I may be mad, but what if we have worth BEYOND our creative output?" The demon replies, "I dunno, sounds pretty fishy to me." 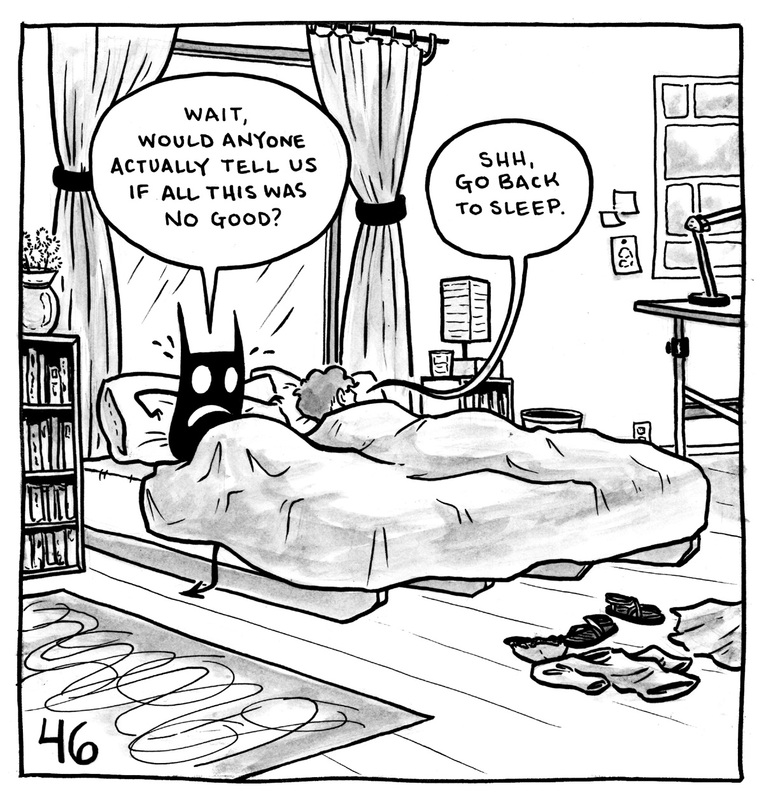 The demon is looking at its watch while Lucy lies facedown in bed. The demon says, "If you keep waiting to start til eleven these are all going to be rubbish." Lucy says, "Okay. First of all: how dare you." 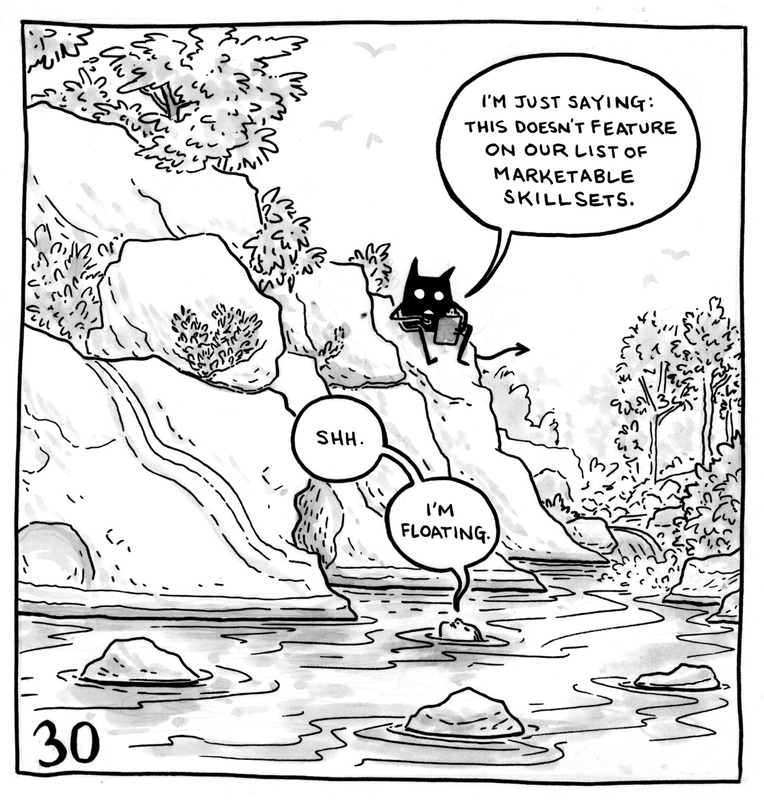 Lucy is floating in a river while the demon sits on top of the riverbed with a clipboard. 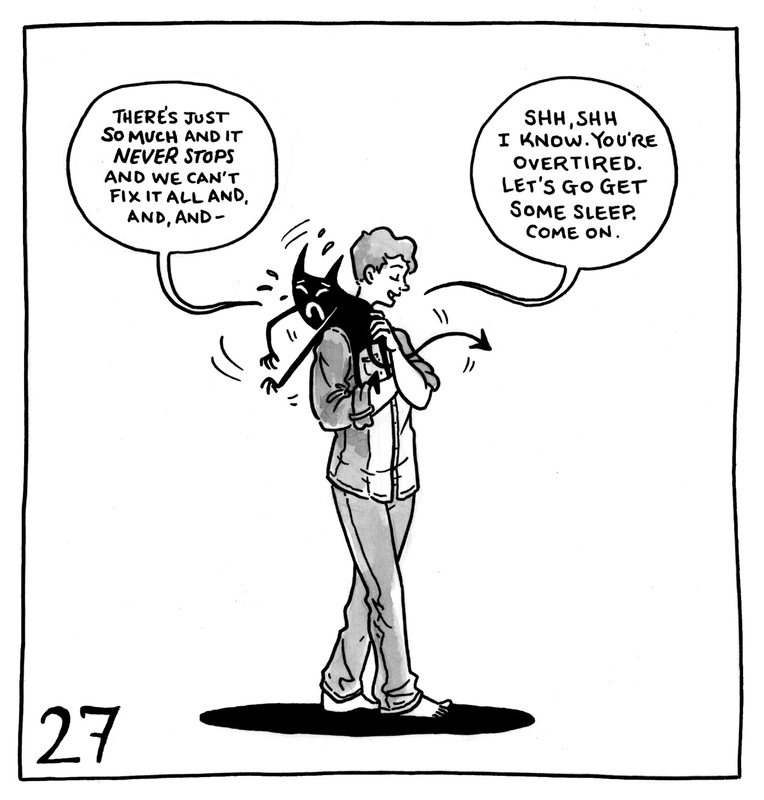 The demon says, "I'm just saying: this doesn't feature on our list of marketable skillsets." Lucy replies, "Shh. I'm floating." Lucy is holding a copy of bill HR 1628, a US bill that would partially repeal Obamacare. Her demon stands next to her, rolling up its sleeve (despite not having any sleeves.) Lucy says, "I can't BELIEVE this. You've got nothing on these monsters." The demon says, "Says who!? Lemme at 'em." 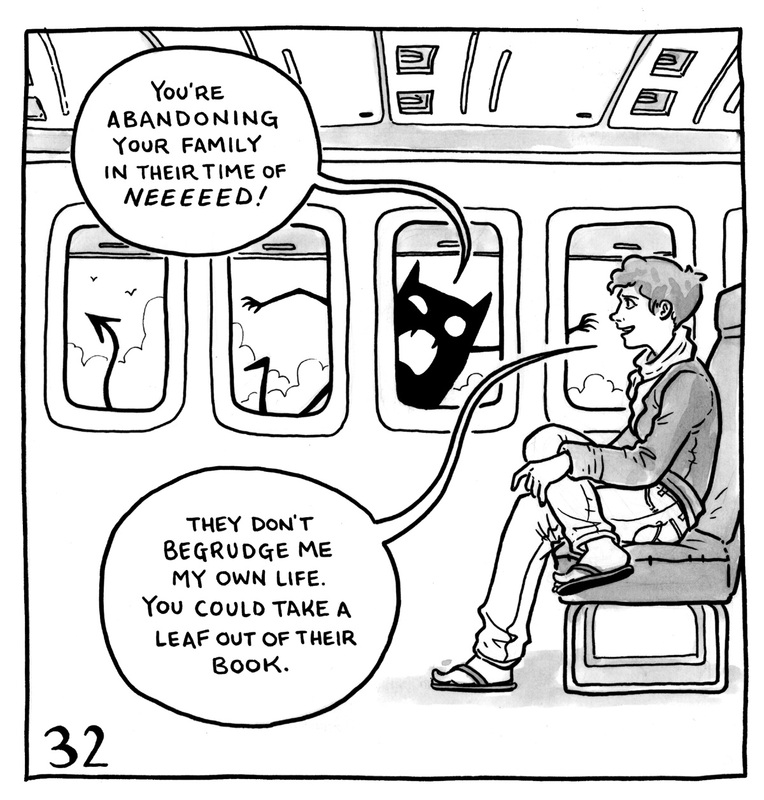 Lucy is in an airplane, the demon plastered to the outside of the window. The demon says, "You're abandoning your family in their time of NEED!" Lucy replies, "They don't begrudge me my own life. You could take a leaf out of their book." 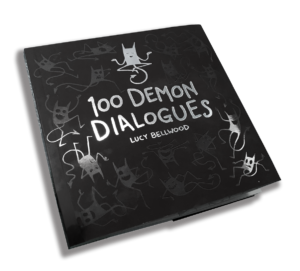 The demon is holding out its hands cautiously, saying "Okay, they like it so far, so long as we change NOTHING--" Meanwhile, Lucy has been drawn extremely messy, with hands bigger than her head and dots for eyes. She says, "Ta-da!" The demon says, "Oh no." The demon holds Lucy's arm, saying, "You're using your laptop too much this wrist shouldn't be hurting like this it's not even your dominant arm is it carpal tunnel maybe it's terminal what if you have to stop working you can't stop working we should amputate just to be safe..."
Lucy is standing with her feet on different grey circles like a game of Twister, almost doing the splits while clinging to a suitcase. The demon lounges on her leg and says, "Oh come on, how hard can it be? Just keep one foot on work and one on wellbeing!" Lucy says, "I do not like this game." 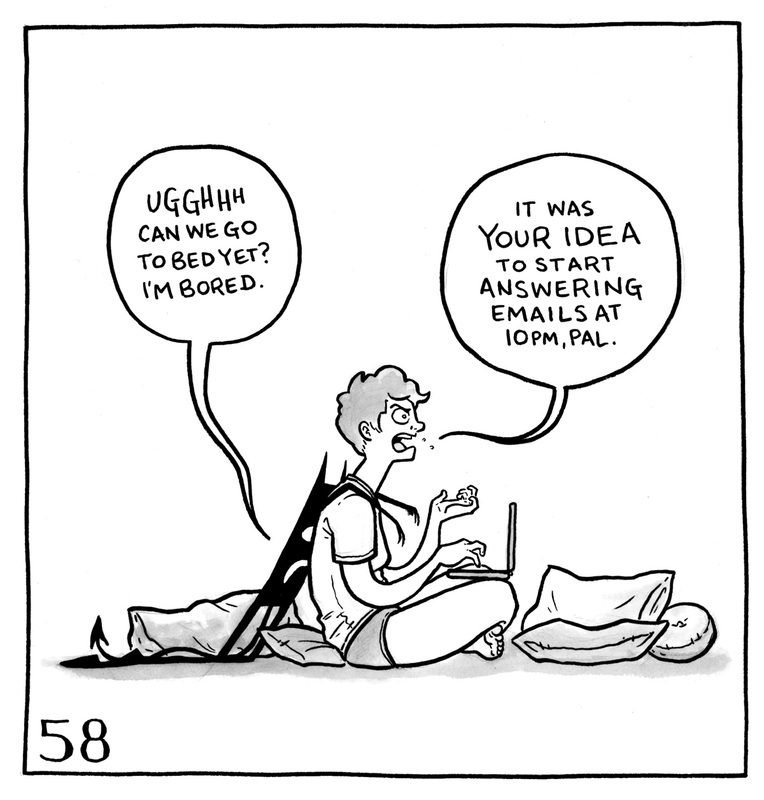 The demon stands over Lucy, who is writing a letter while her phone rests beside her. 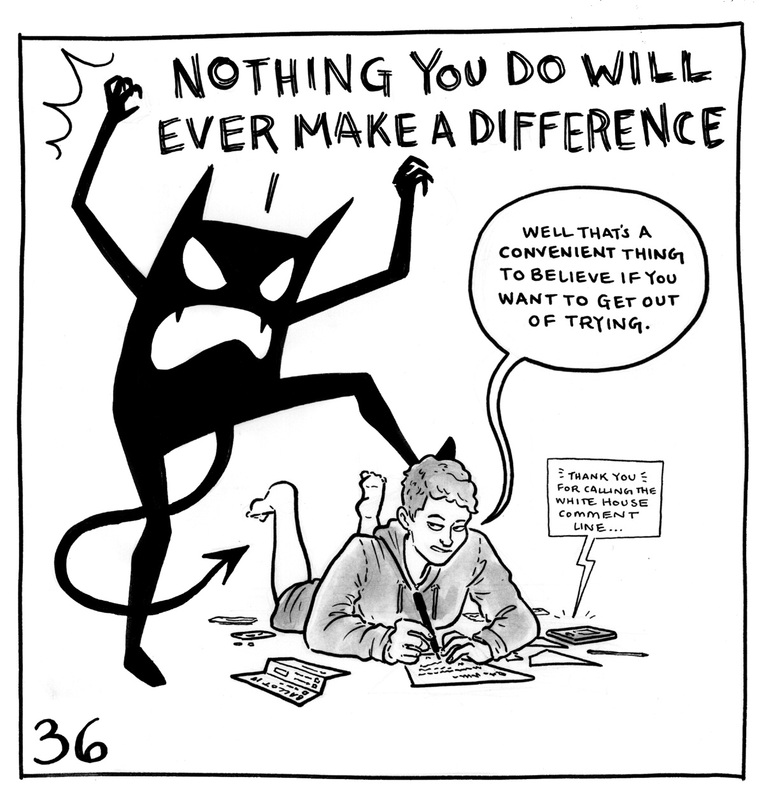 The demon shrieks "NOTHING YOU DO WILL EVER MAKE A DIFFERENCE!" Lucy replies, "Well that's a convenient thing to believe if you want to get out of trying." A message coming from the phone reads, "Thank you for calling the White House Comment Line..."
Lucy sits cross legged in the middle of a geometric design where one line branches out into hundreds of paths. The demon mimics her position above her, saying "Your indecision is going to drive everyone away." The demon is carrying a stack of books and papers, grinning while Lucy looks at it in horror. The demon says ,"The only way to avoid being let down is to do everything yourself." Lucy says, "I can't do all this ALONE, are you nuts?!" The demon stands beside Lucy, whose head has become a large thundercloud complete with a raging thunderstorm. The demon says, "It will always be like this!" Lucy says, "It will not always be like this." Lucy holds a small star in her hands while the demon stands beside her, aghast. Lucy says, "These are my needs!" 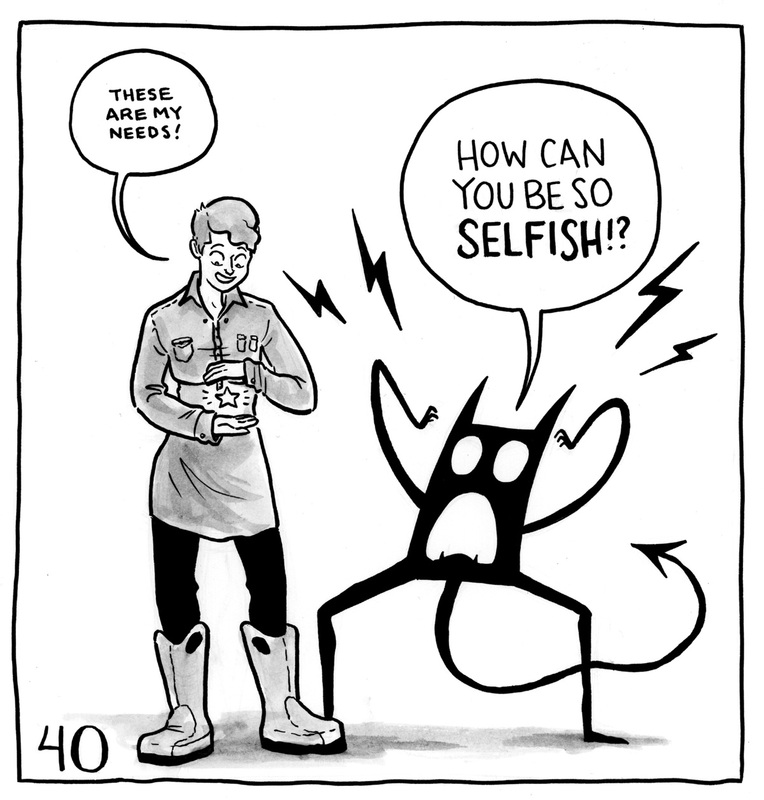 The demon says, "How can you be so SELFISH!?" 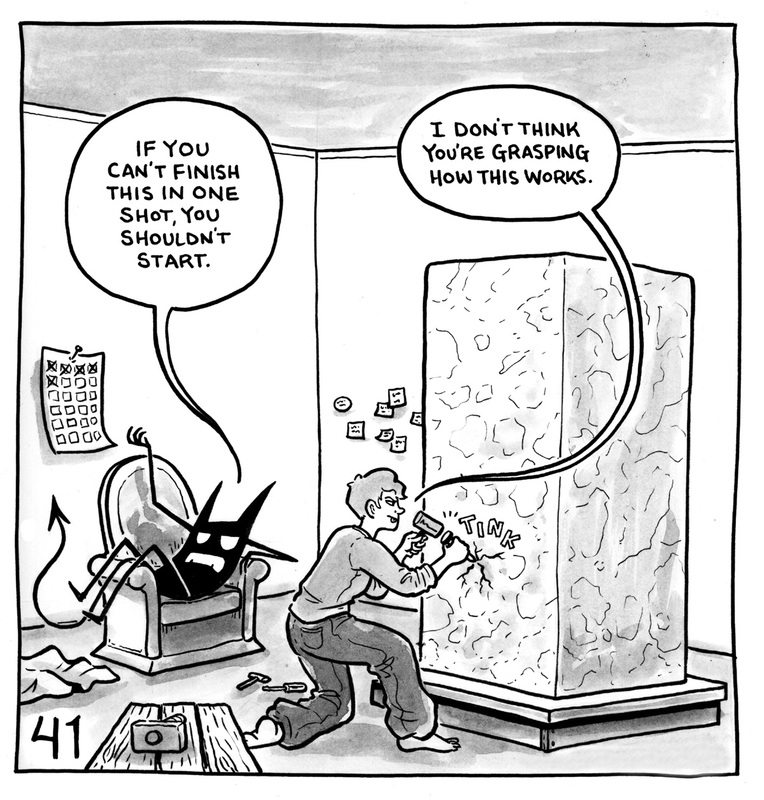 Lucy is starting to sculpt a large slab of marble while the demon sits in an armchair. The demon says, "If you can't finish this in one shot, you shouldn't start." Lucy replies, "I don't think you're grasping how this works." 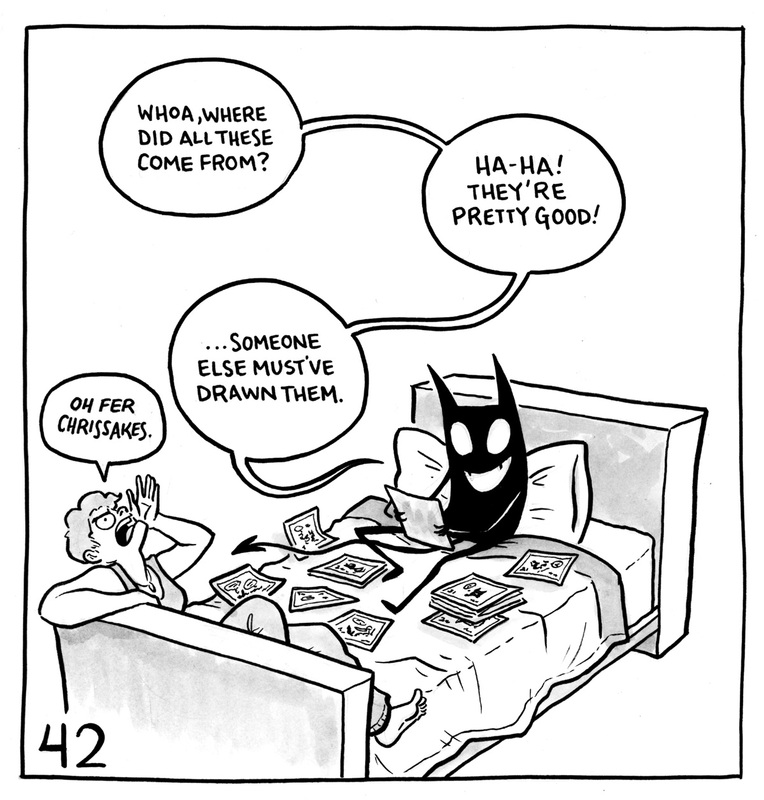 Lucy and the demon are sitting on a bed that's covered in Lucy's drawings. The demon says, "Whoa, where did all these come from? Ha-ha! They're pretty good! ...Someone else must've drawn them." Lucy cries, "OH FOR CHRIST'S SAKES." 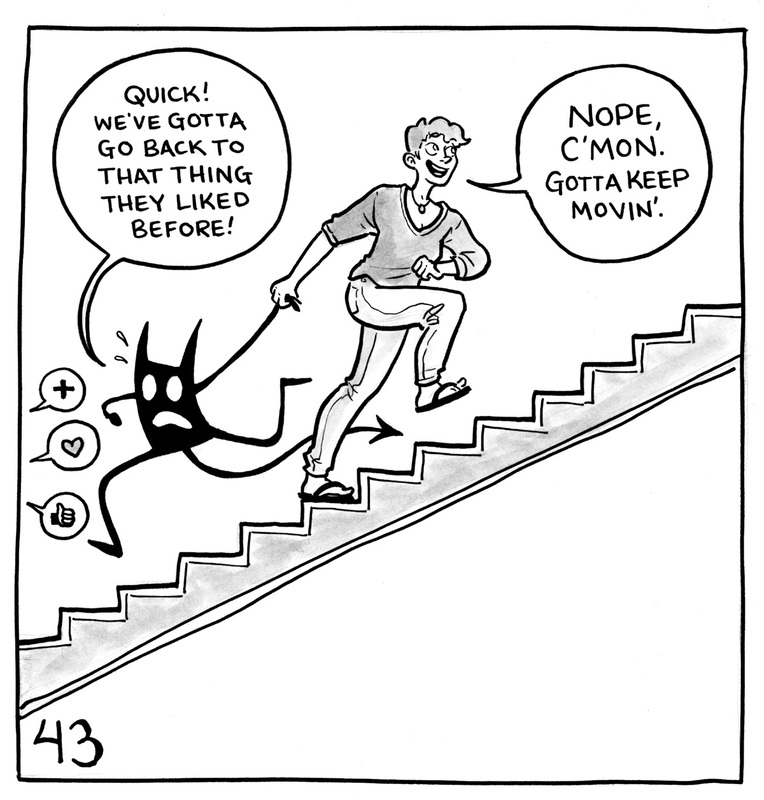 Lucy is walking up a staircase, dragging her demon behind her. 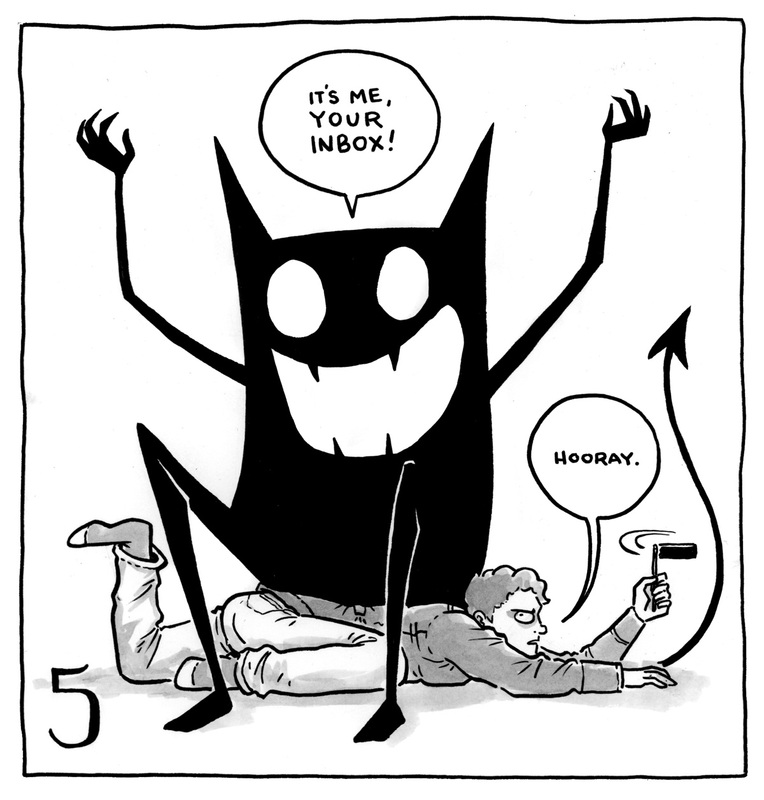 Speech bubbles with hearts, likes and upvotes are behind them, and the demon is trying to run towards them. The demon says, "Quick! We've gotta go back to that thing they liked before!" Lucy says, "Nope, c'mon. Gotta keep movin'." The demon is lying on top of Lucy's desk while Lucy runs her hands through her hair, wide-eyed with frustration. 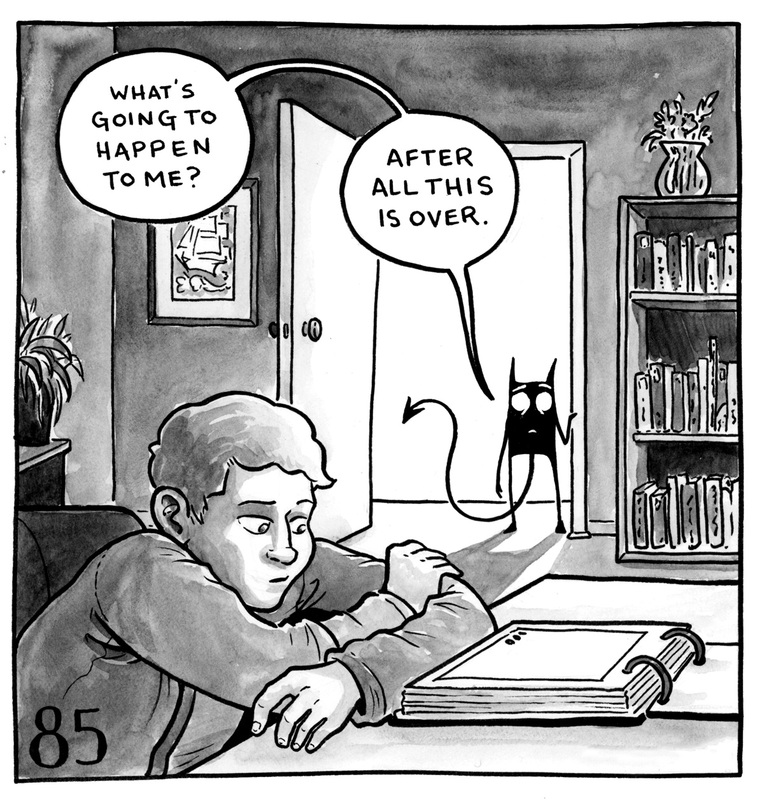 The demon says, "If you never turn it in, they can never tell you it's bad." Lucy says, "How many times do I have to tell you: STOP SITTING ON MY PAGES. I swear this is worse than having a cat." Lucy slumps in the corner of a boxing ring with a black eye, wearing boxing gloves. The demon stands before her, wearing shorts, a concerned expression on its face. Lucy says, "Fifty-five more? Couldn't we just take a nap instead? Forget all this?" The demon says, "But you can't give up now! Who will document my charming antics?" Lucy is sleeping in bed, the demon sitting bolt upright beside her. 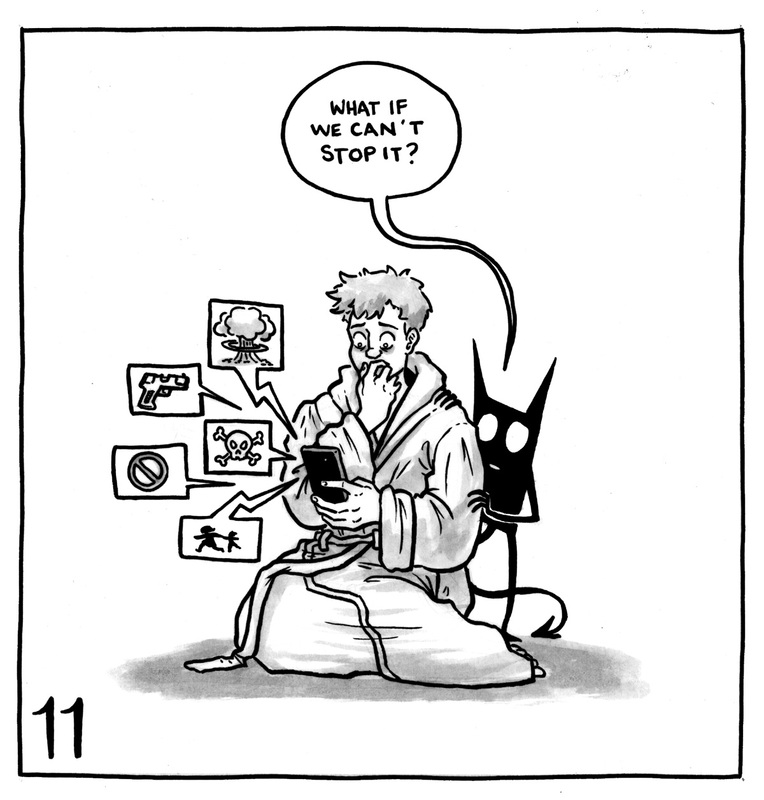 The demon says, "Wait, would anyone actually tell us if all this was no good?" Lucy says, "Shh, go back to sleep." 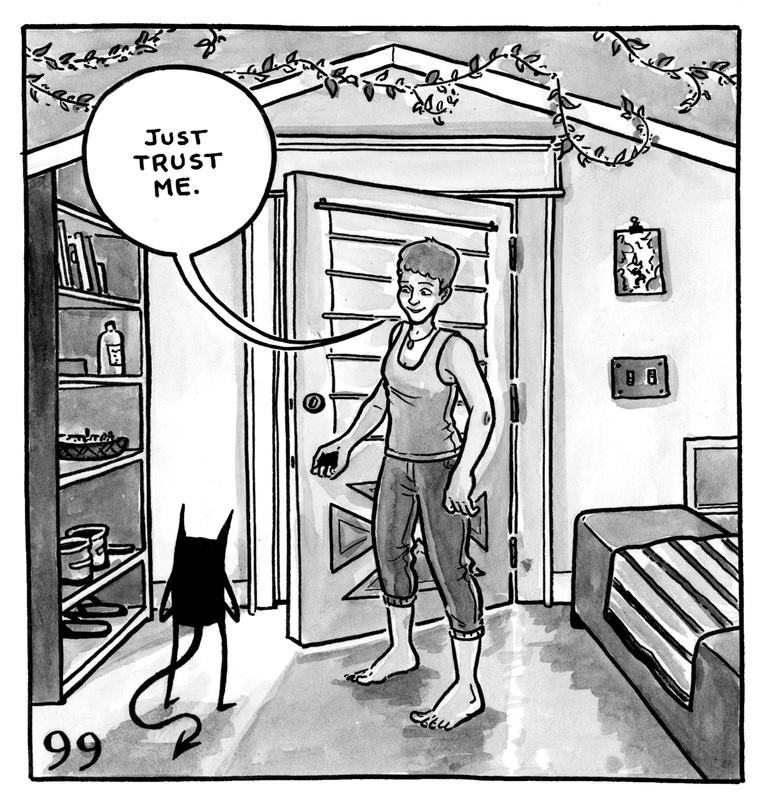 The demon is standing by an open door, wearing a party hat and a lei. Loud bass is coming from the door. Lucy is in bed, almost completely covered by a blanket. 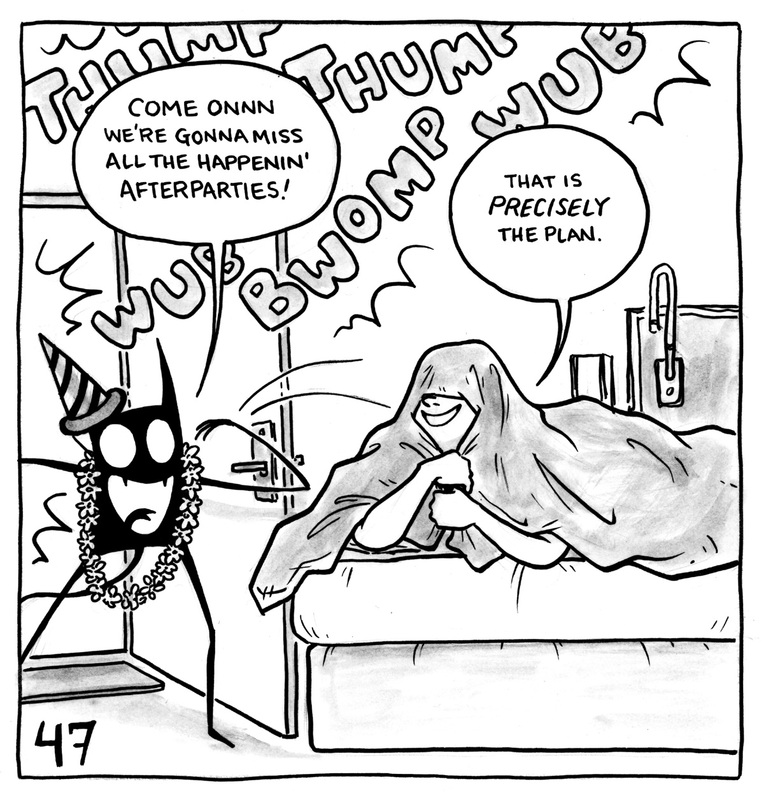 The demon says, "Come on, we're gonna miss all the happenin' afterparties!" Lucy says, "That is PRECISELY the plan." The demon stands next to Lucy, who is glaring at it. 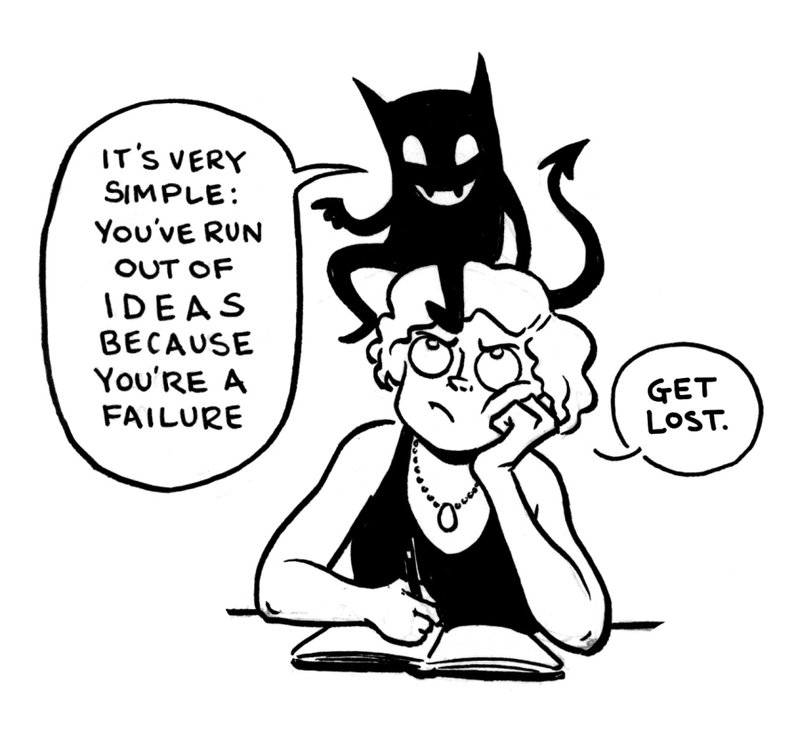 The demon asks, "So, what are you working on next?" Lucy asks "Can't I just do the thing I'm working on now?" The demon stands next to Lucy with a hand on her arm. She sits with her elbows on her knees. 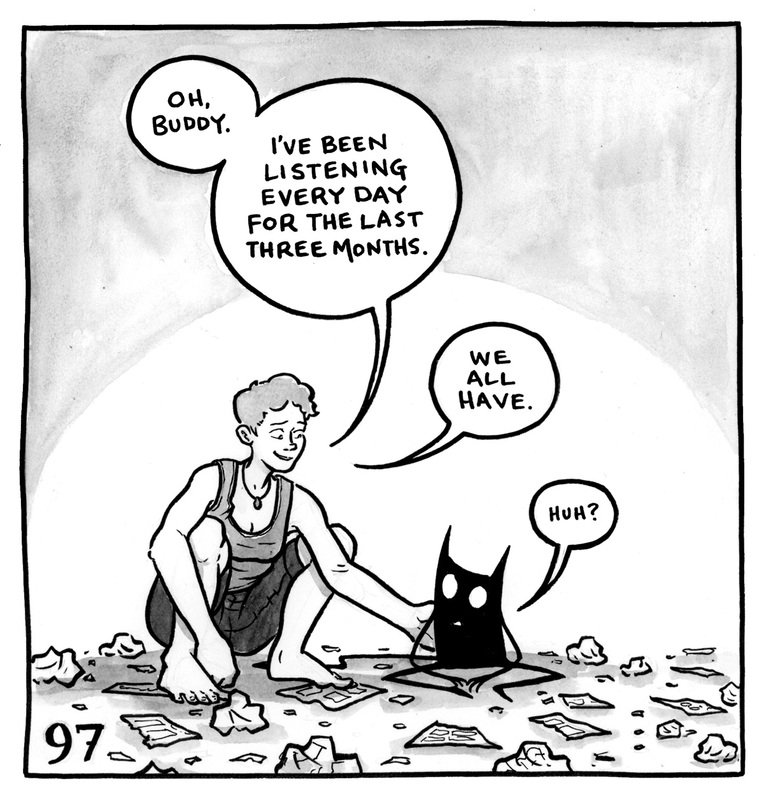 The demon says, "Listen, I think you've been pushing too hard--you're going to make yourself sick at this rate." Lucy says, "I can't afford to slow down." Lucy lies on her back, holding a tissue. The demon is sitting with its legs underneath her, holding a box of tissues and looking distinctly unimpressed. Lucy says, "Oh no I am sick." The demon says, "What a surprise." Lucy snaps back, "Quiet, you." The demon continues, "Who could have possibly foreseen this." Lucy is resting in an armchair with a book, a mug of tea, and a box of tissues while the demon stands behind the chair. The demon cries, "WHAT ARE YOU DOING!?" Lucy replies, "Resting! Like you told me to." 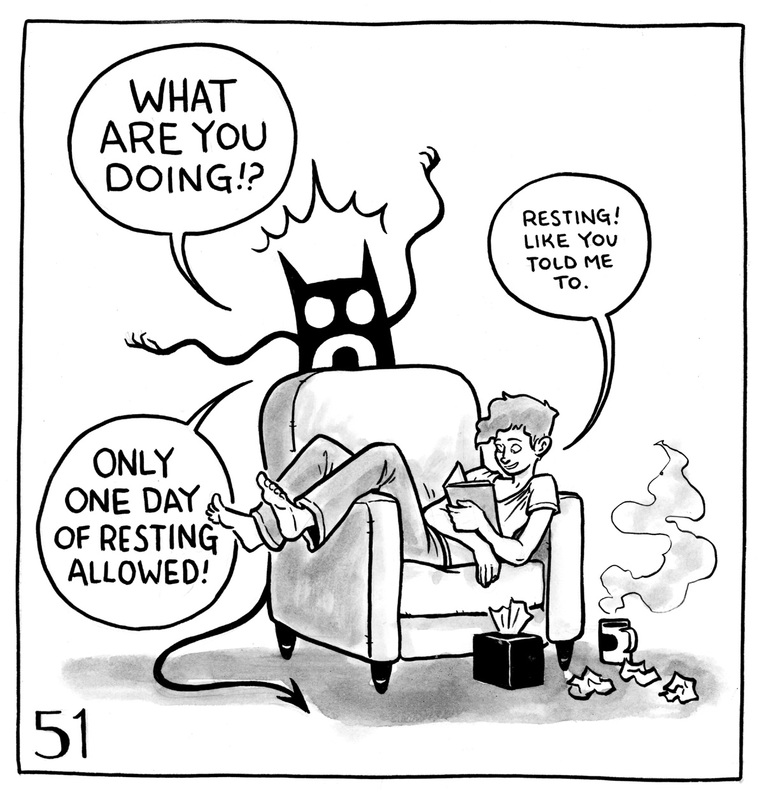 The demon says, "Only one day of resting allowed!" 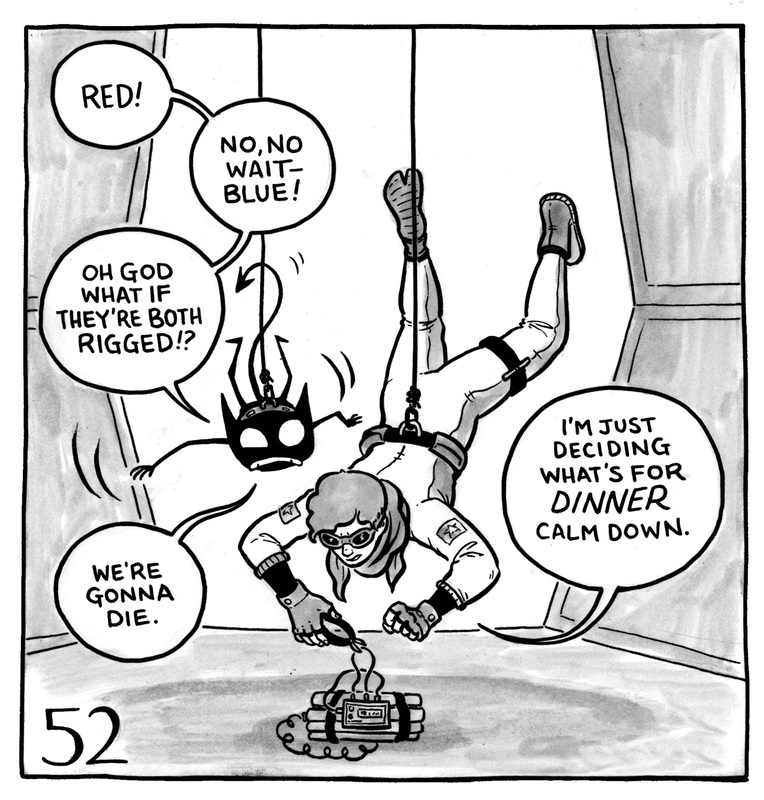 Lucy and the demon hang from the ceiling via cables a la Mission Impossible. Lucy is about to clip a wire attached to a bomb. The demon says, "Red! No, no wait--BLUE! Oh God what if they're both rigged!?" Lucy says, "I'm just deciding what's for DINNER calm down." The demon concludes, "We're gonna die." The demon sits away from a crowd of smiling people while Lucy reaches towards it. The demon says, "Nobody's going to help." Lucy says, "We're part of a community, and communities help each other." Lucy is hugging the demon, which is struggling to get away from her. Lucy says, "Hey, I love you." The demon says "WHAT?! Ew. Gross. Shut up." Lucy continues, "You're doing a good job." The demon fires back, "No, YOU are. ...Wait. I mean...whatever. You smell." The demon is standing next to Lucy, who now has been drawn like an abstract painting. Her mouth is on one side of her head, her nose on the other, her eyes going in different directions and her ears sticking out on either side of her deformed head. 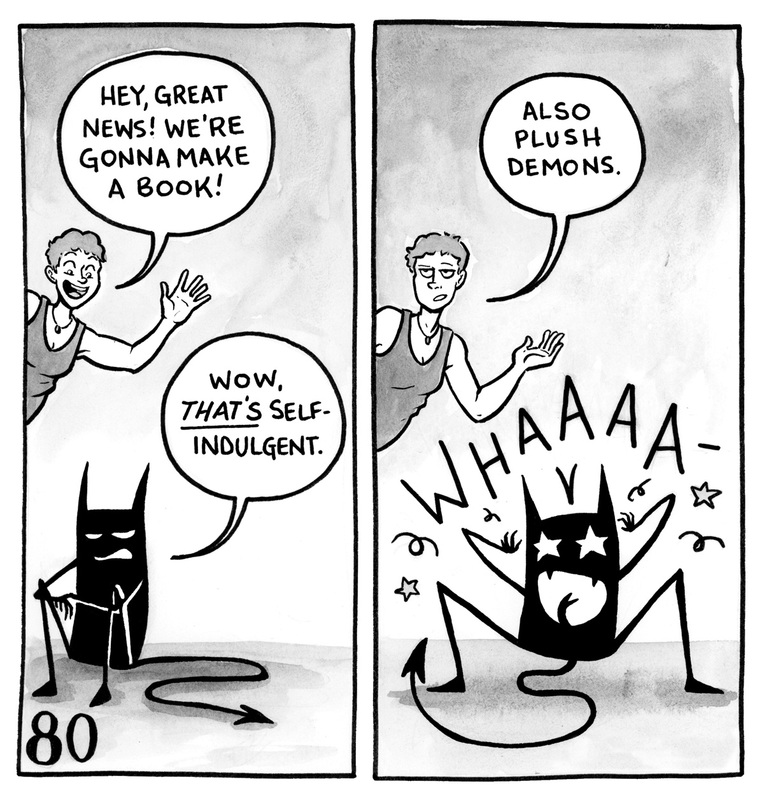 The demon says, "Augh, your style is so inconsistent!" Lucy says, "Huh?" 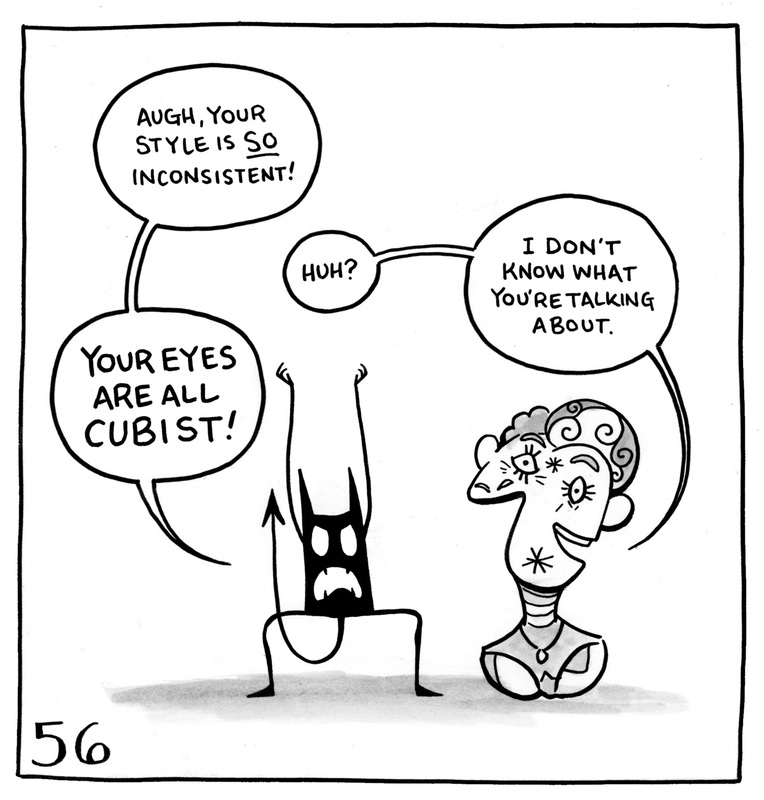 The demon cries, "ALL YOUR EYES ARE CUBIST!" Lucy says, "I don't know what you're talking about." Lucy is sitting at her desk drawing, her demon standing beside her. Behind her is a grey cloud filled with white, staring eyes. Lucy asks, "Do you ever feel like we're being...watched?" The demon says, "Don't turn around." Lucy has her laptop open while the demon is hanging off of her shoulders. The demon whines, "Ugghhh can we go to bed yet? I'm bored." Lucy says, "It was YOUR IDEA to start answering emails at 10pm, pal." The demon is wearing a beret. Lucy is sitting next to it. 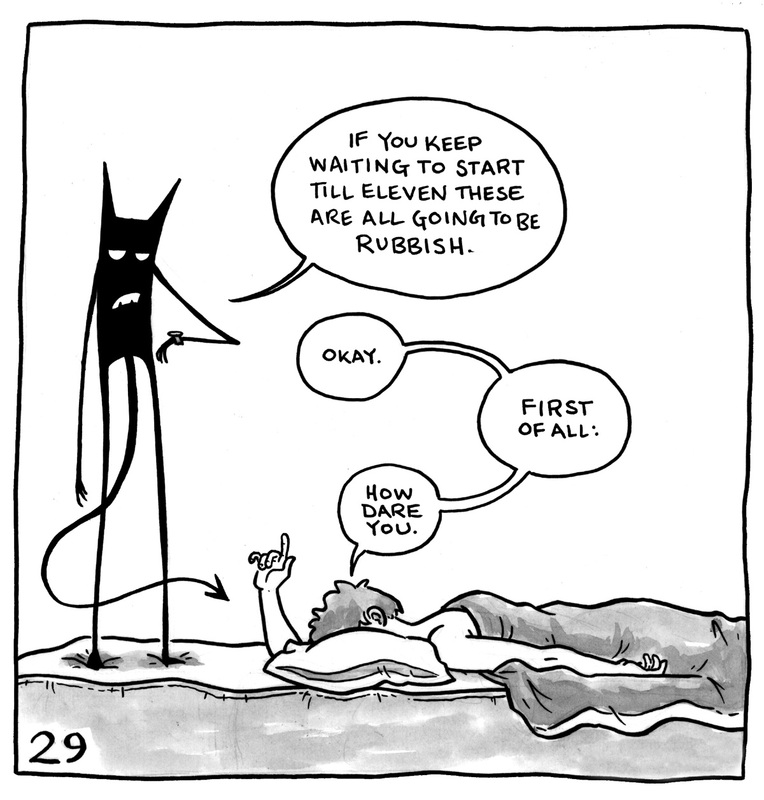 The demon says, "A REAL artist never runs out of ideas." Lucy replies, "It must be so nice, this other dimension you inhabit." The demon is sulking while Lucy nudges it with a broom. 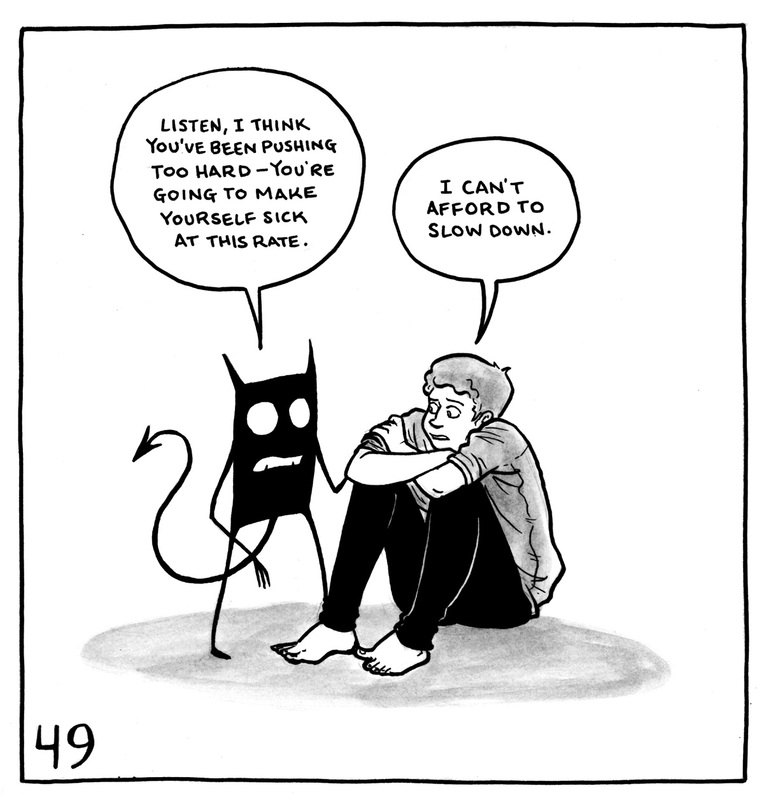 The demon says, "Maybe we deserve to feel miserable." Lucy says, "That's it, I'm taking you out for a walk. No moping. Come on." 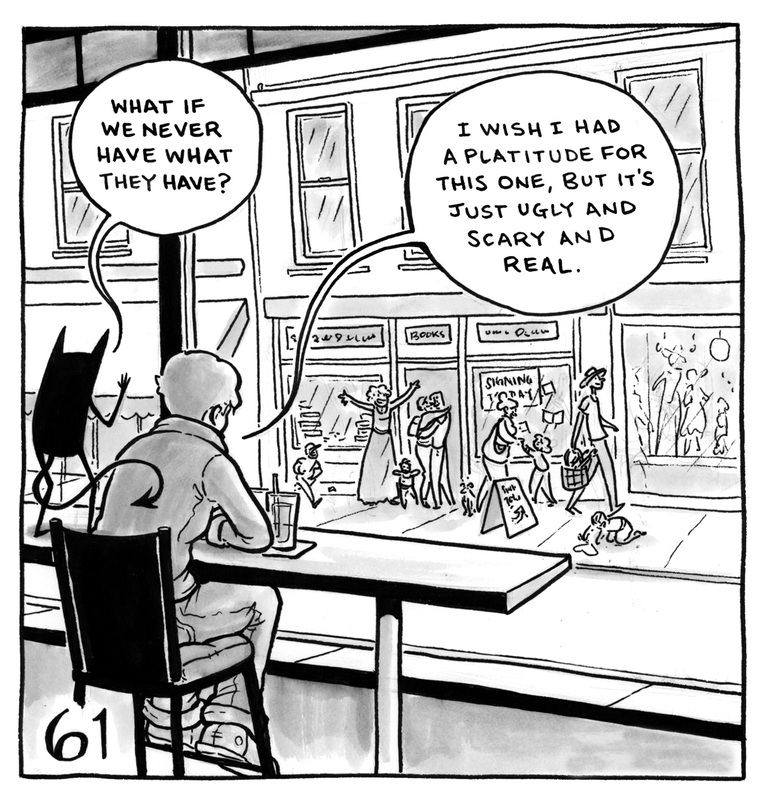 Lucy and the demon sit in a cafe, looking at people across the street. The demon asks, "What if we never have what they have?" Lucy replies, "I wish I had a platitude for this one, but it's just ugly and scary and real." 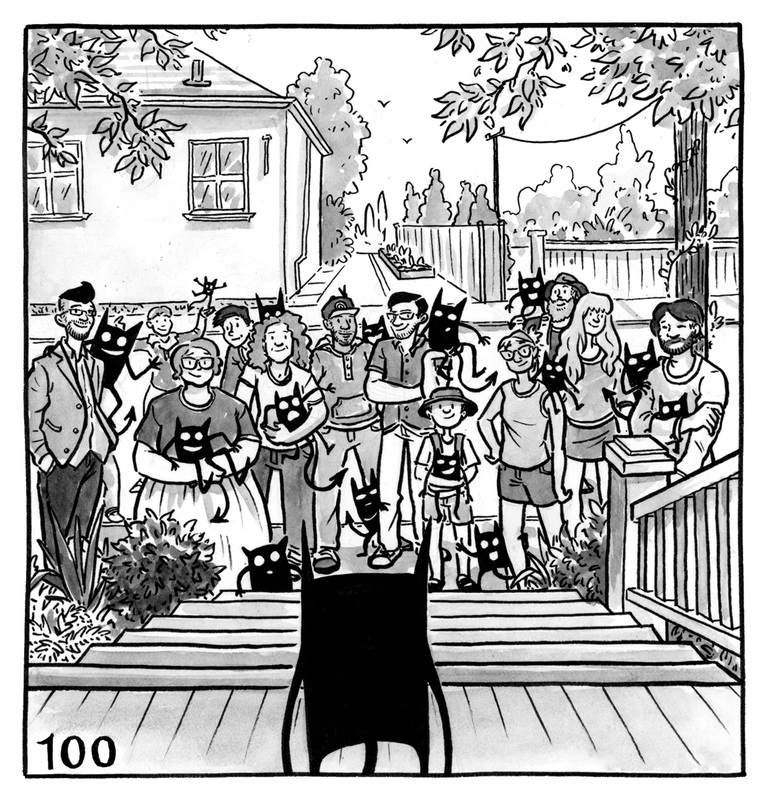 The demon has a bow and arrow, drawn and pointed at Lucy. 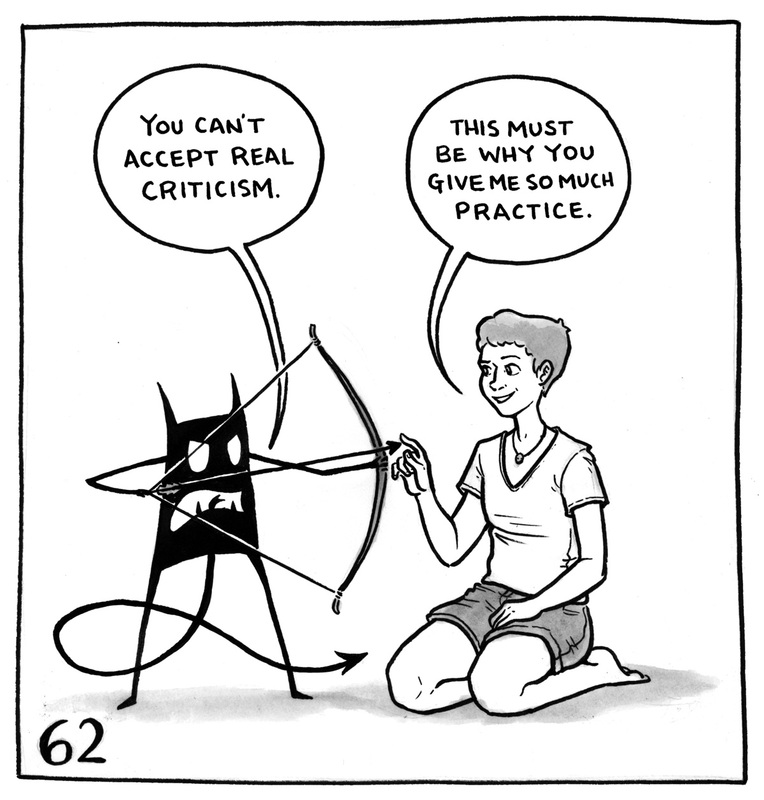 The demon says, "You can't accept real criticism." Lucy replies, "This must be why you give me so much practice." Lucy is sitting with an ice cream cone while the demon holds a sandwich taller than itself. Lucy says, "You're biting off more than you can chew." 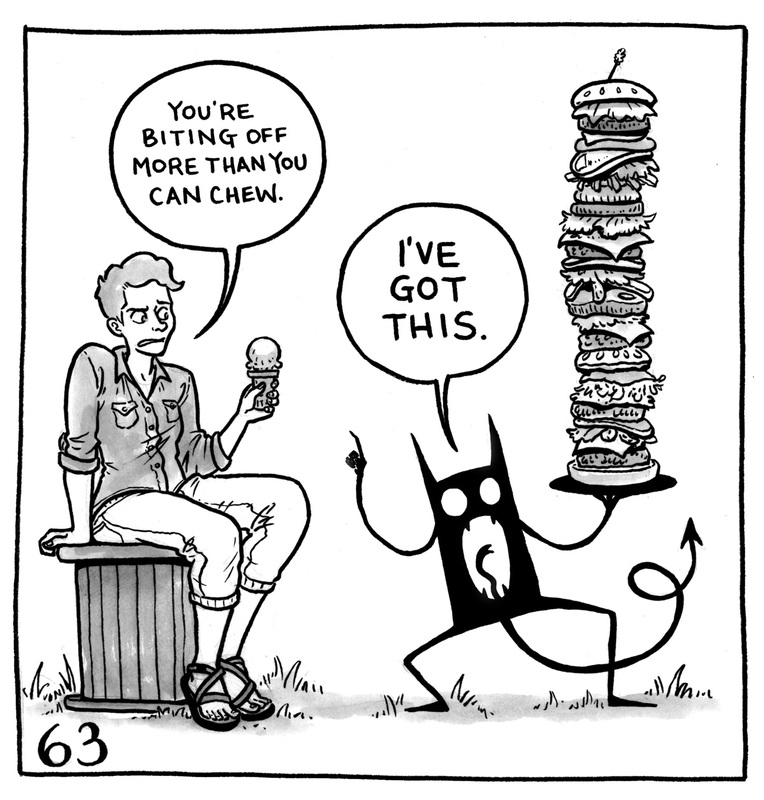 The demon says, "I'VE GOT THIS." 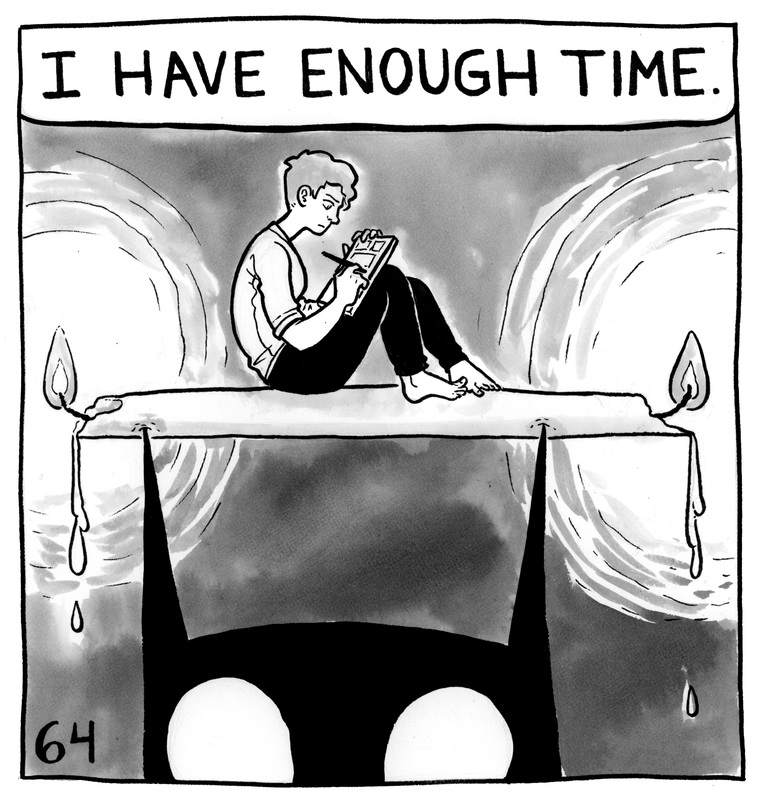 Lucy is working on a comic, sitting on a large candle with both ends burning. The candle is resting on top of the demon's pointy ears. Lucy is saying, "I have enough time." Lucy is lifting a large weight in front of a cheering crowd. 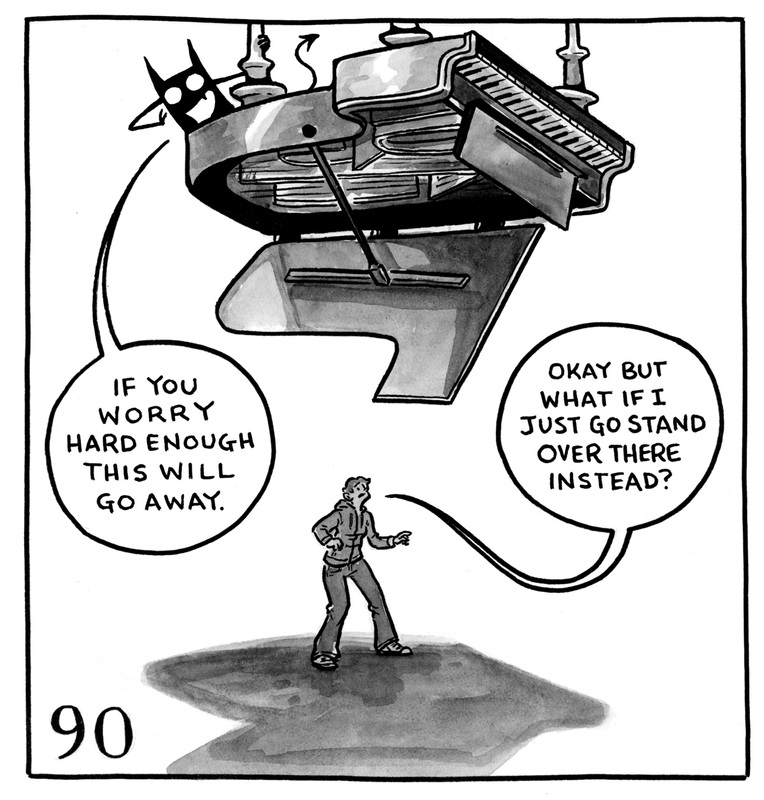 Her demon sits on the weight and says, "These feats of freelance strenght won't protect you from life's perpetual impermanence." Lucy yells back, "LET ME HAVE THIS!" Lucy is looking at her demon, which looks like a smartphone with arms, legs and a tail, the demon's face on the screen. The demon says, "FEED ME." Lucy replies, "But I get so much more done when I don't." 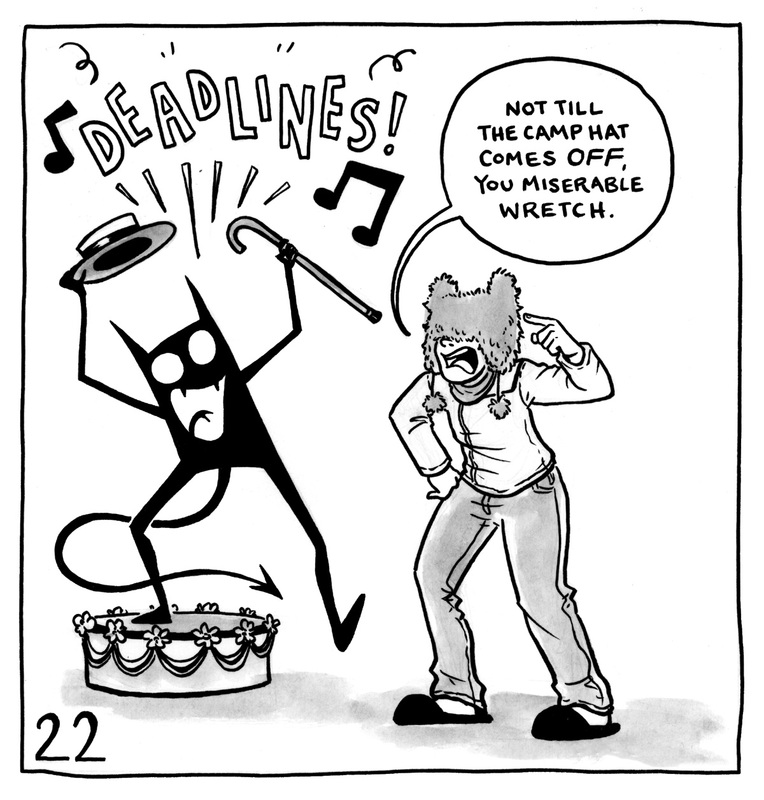 Lucy is drawing something while her demon stands on her back, wearing sunglasses and shouting into a megaphone. It says, "QUIT BEING SO LAZY! WORK HARDER! YOU'VE GOTTEN NOTHING DONE!" Lucy says, "I am gathering a large body of evidence to refute this." Lucy is cheering while the demon is on all fours, hair raised like a cat. Lucy cheers, "Congratulations! You worked so hard and got throught all that hard stuff! You deserve a break." The demon hisses loudly at her. Lucy is holding a spray bottle. 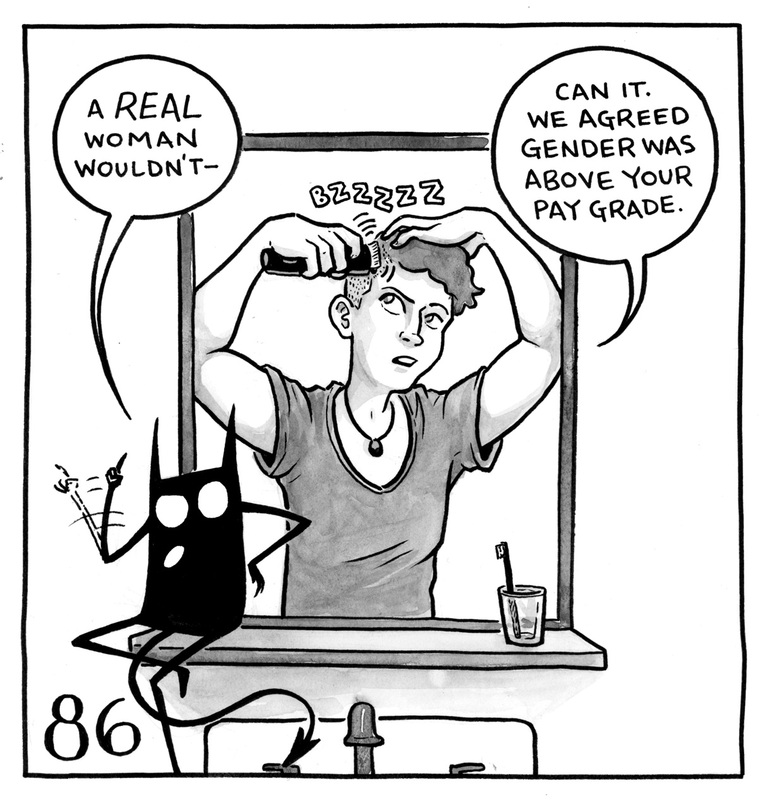 Her demon is standing on a dresser, wearing a cape and waving a pendulum back and forth like a hypnotist. 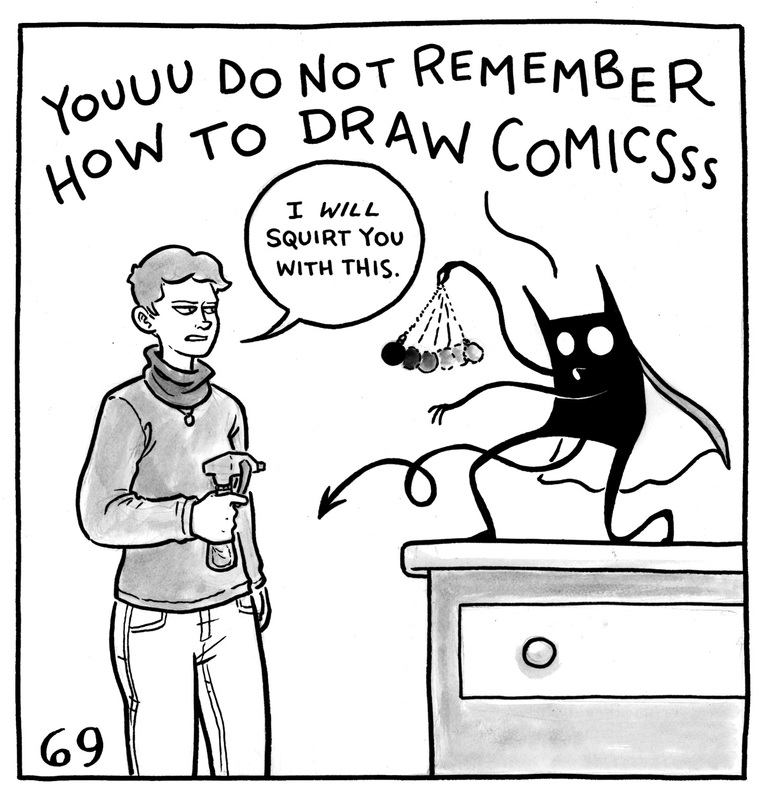 It croons, "You do not remember how to draw comics..." Lucy says, "I WILL squirt you with this." 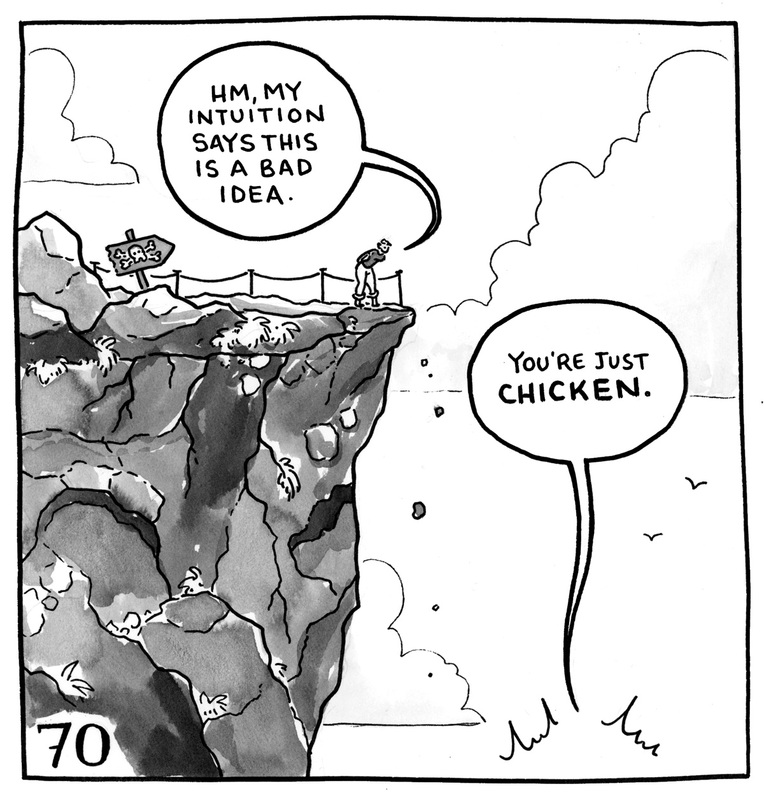 Lucy is looking over the edge of a cliff. She says, "My intuition says this is a bad idea." 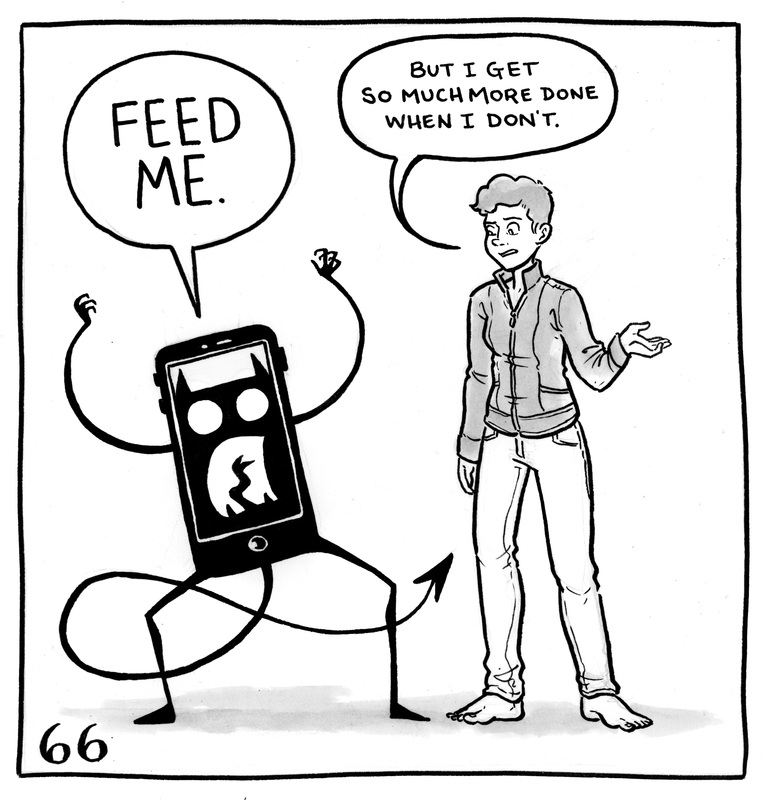 From off of the bottom of the page, the demon says, "You're just CHICKEN." Lucy is wearing a stack of hats and looking at herself in a mirror that the demon is holding up. 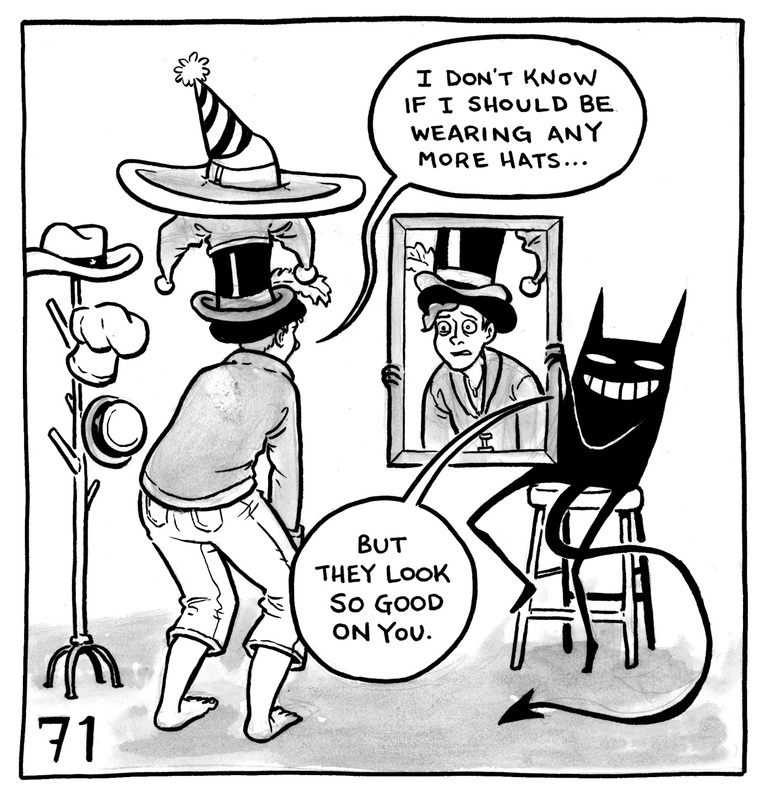 She says, "I don't know if I should be wearing any more hats..." The demon says, "But they look so good on you." 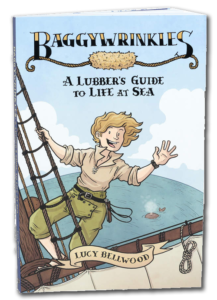 Lucy and her demon are leaning on the top yard of a tall sailing ship, high among the seagulls. 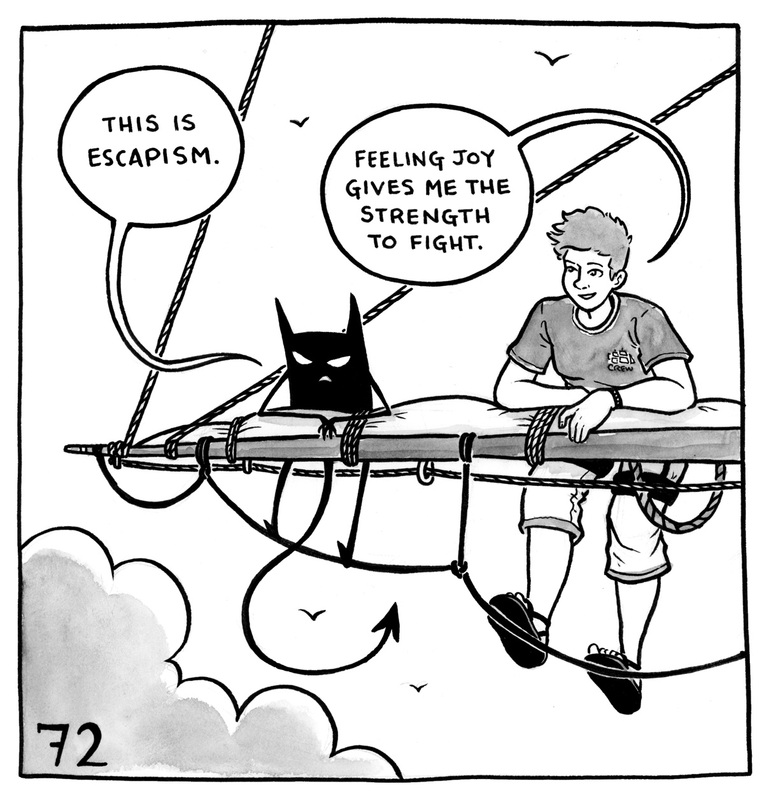 The demon says, "This is escapism." Lucy says, "Feeling joy gives me the strength to fight." Lucy is facing a fan who is holding one of her books. Her demon stands at their feet. 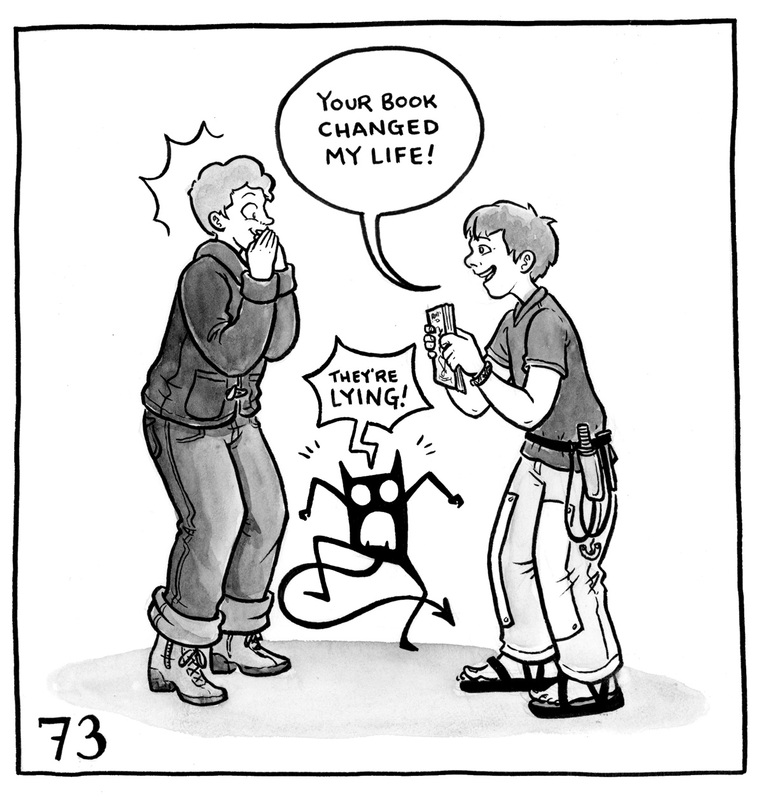 The fan says, "Your book changed my life!" The demon says, "They're LYING!" Lucy is drawing something. Her demon stands beside her, eyes large in an attempt to be endearing. Lucy is saying, "Okay, I'm three days behind, so if I draw two at breakfast and another while I'm working at the table..." The demon interjects in a sing-song voice, "You could skip a day..." Lucy replies, "ABSOLUTELY NOT." The demon is sneering while Lucy shakes hands with someone offscreen. 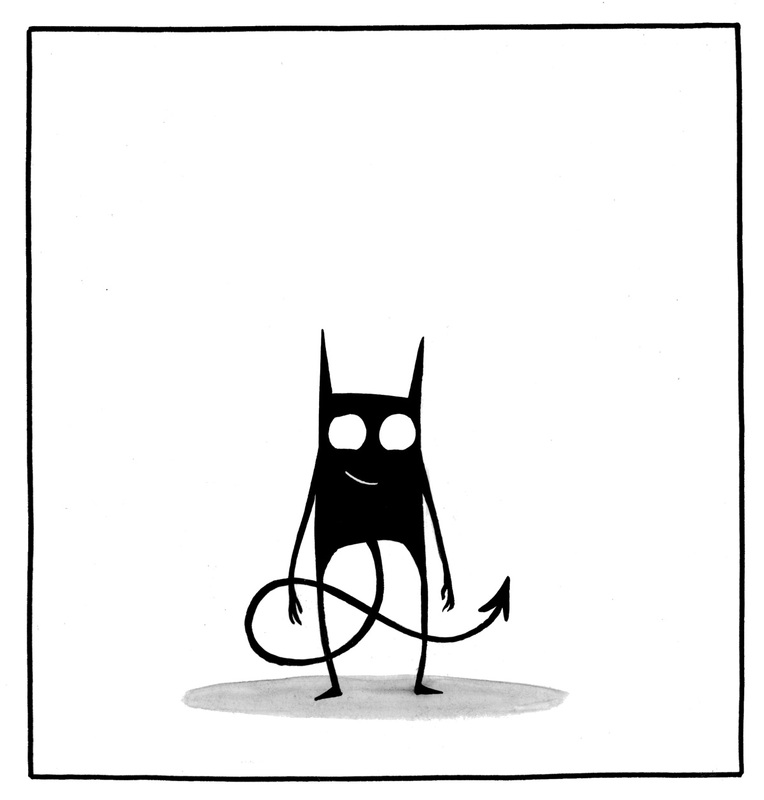 The demon says, "The only thing you're REALLY good at is convincing people you've got your whole act together." Lucy says, "You know I've been posting ALL OF THESE on the internet, right? We're rumbled." Lucy is jumping off of the high dive, pulling her demon off the board by its tail while a group of people cheer them on. Lucy says, "I know it feels scary, but we're gonna grow so much from this!" while the demon is howls a drawn out "NO!" Lucy has just made it through an obstacle course consisting of monkey bars, barbed wire, and a rock climbing wall. Her demon has moved the goalpost away from her. Lucy says, "At last! 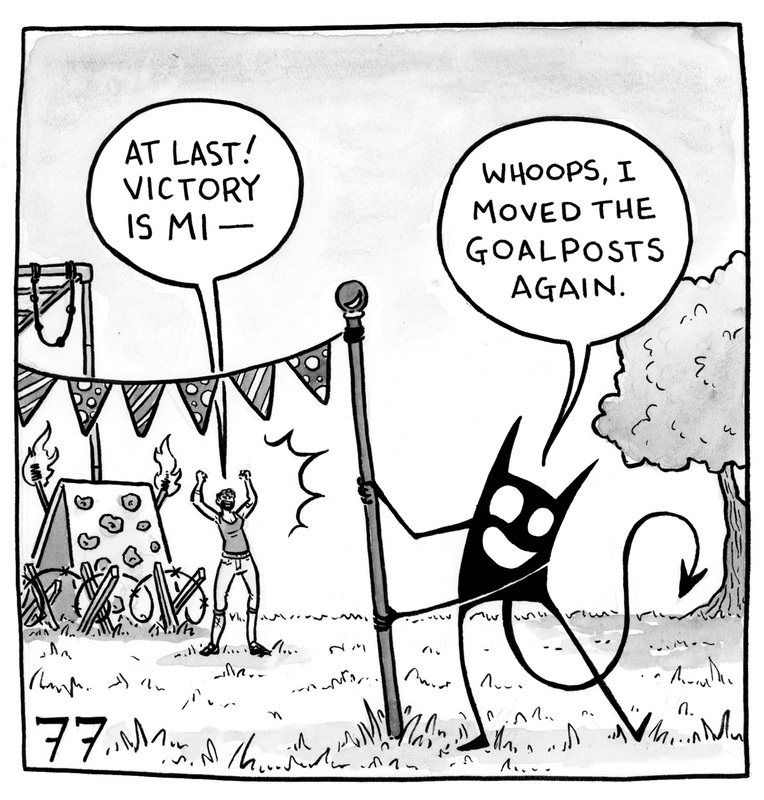 Victory is mine--" Her demon says, "Whoops, I moved the goalposts again." 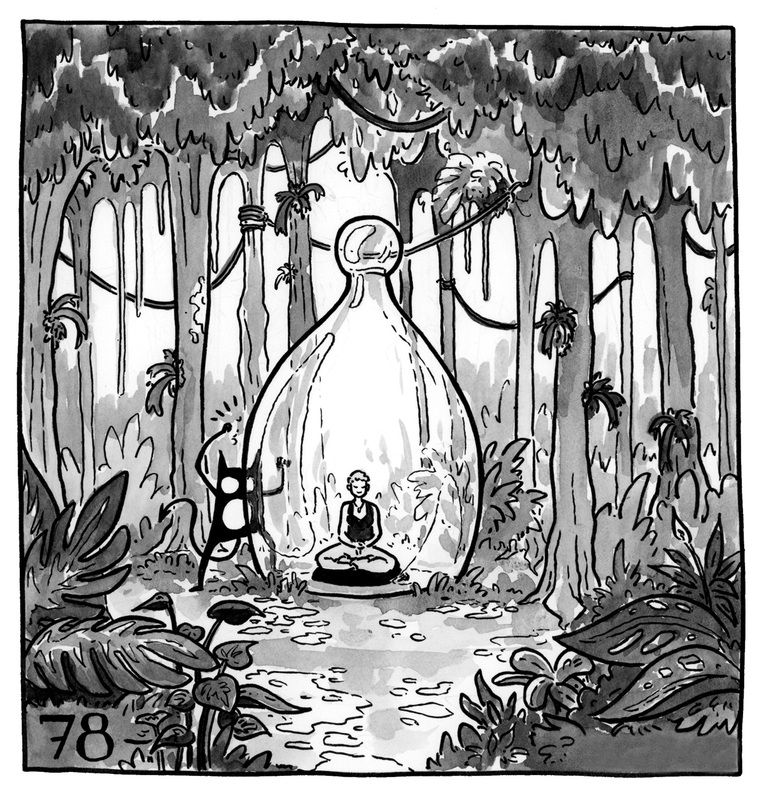 Lucy is sitting in a large glass bulb in a beautiful, lush forest, eyes closed, meditating while her demon pounds uselessly at the glass. 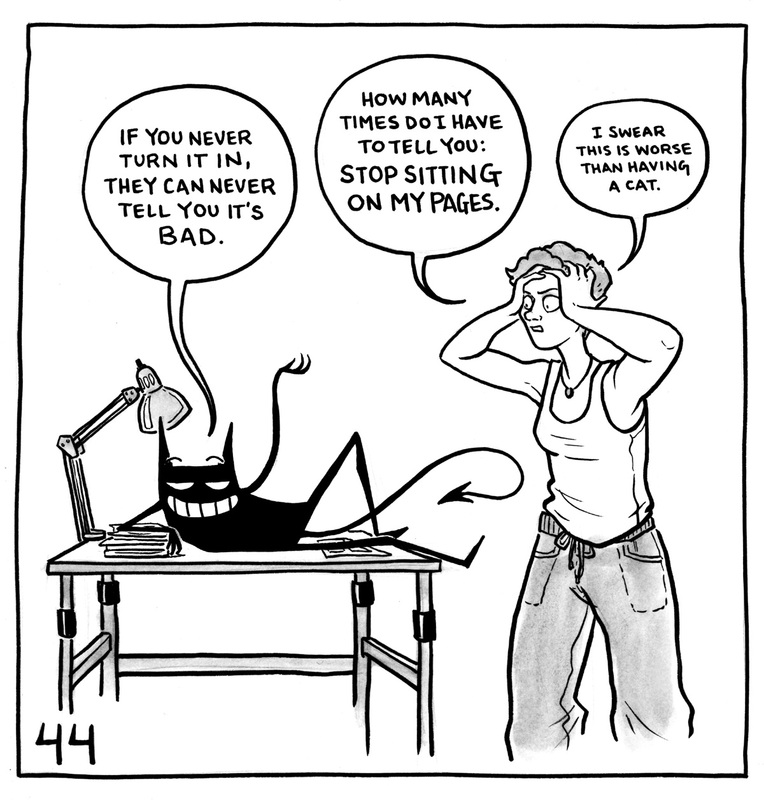 The demon is in a figure drawing class, sitting at an easel while Lucy poses. The demon says, "Why didn't you tell me this was so HARD!?" Lucy replies, "It's always hardest at the start. Give it time." Lucy is telling the demon, "Great news! We're gonna make a book!" The demon replies, "Wow, THAT'S self indulgent." Lucy adds, "Also plush demons." 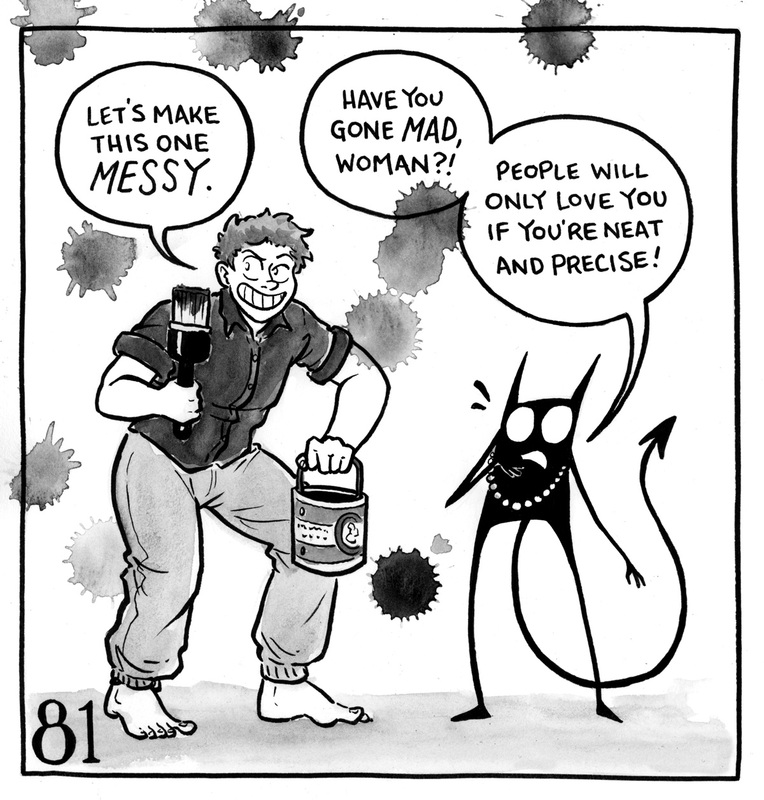 The demon goes starry eyed and yells, "WHAT--"
Lucy is holding a bucket of paint and a brush, and is surrounded by paint splatters. Her demon, now wearing a string of pearls, is mortified. Lucy says, "Let's make this one MESSY." The demon says, "Have you gone mad, woman?! People will only love you if you're neat and precise!" Lucy is making a wood carving of her demon with a chainsaw while the demon bangs cymbals together. 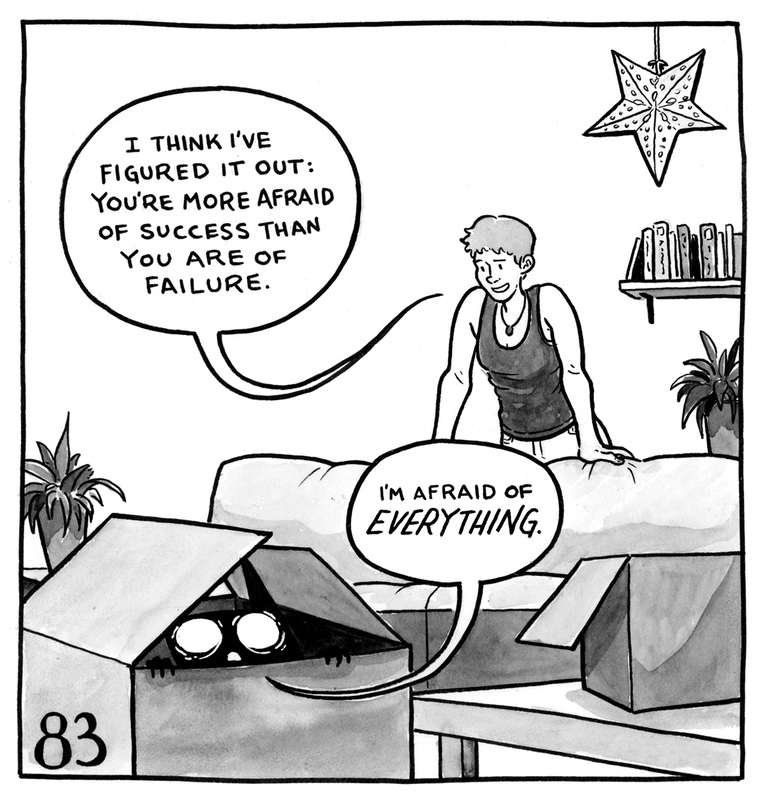 The demon says, "The secret to your success is perpetual vigilance and anxiety." Lucy replies, "We can keep the power and leave the fear." Lucy is looking at her demon, who is hiding in a box. Lucy says, "I think I've figured it out: you're more afraid of success than you are of failure." Her demon whimpers, "I'm afraid of EVERYTHING." Lucy and her demon are looking at a massive statue of Perseus holding the head of Medusa. 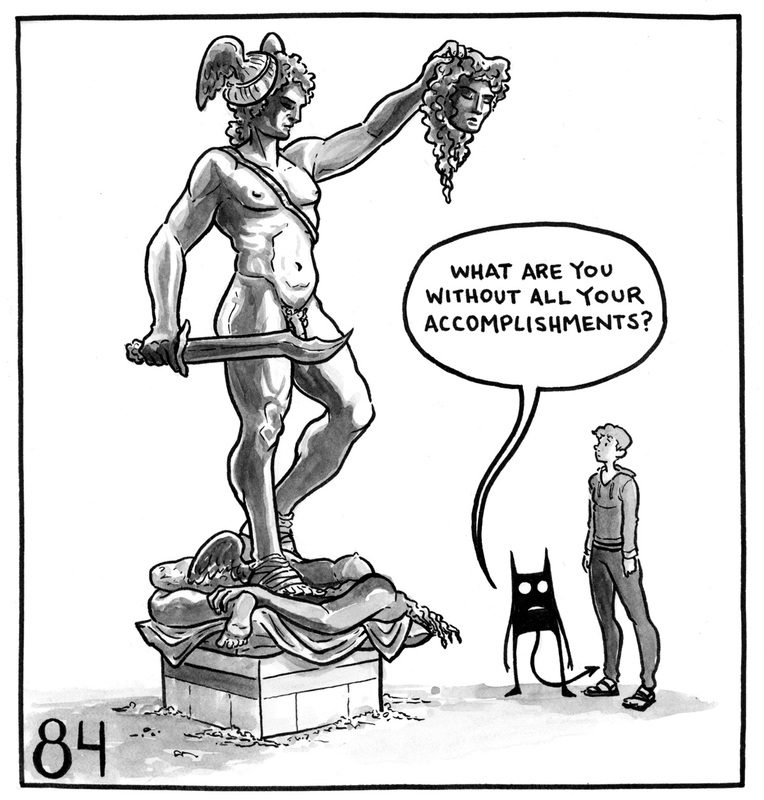 The demon asks, "What are you without all your accomplisments?" The demon stands in a doorway, looking at Lucy at her desk. 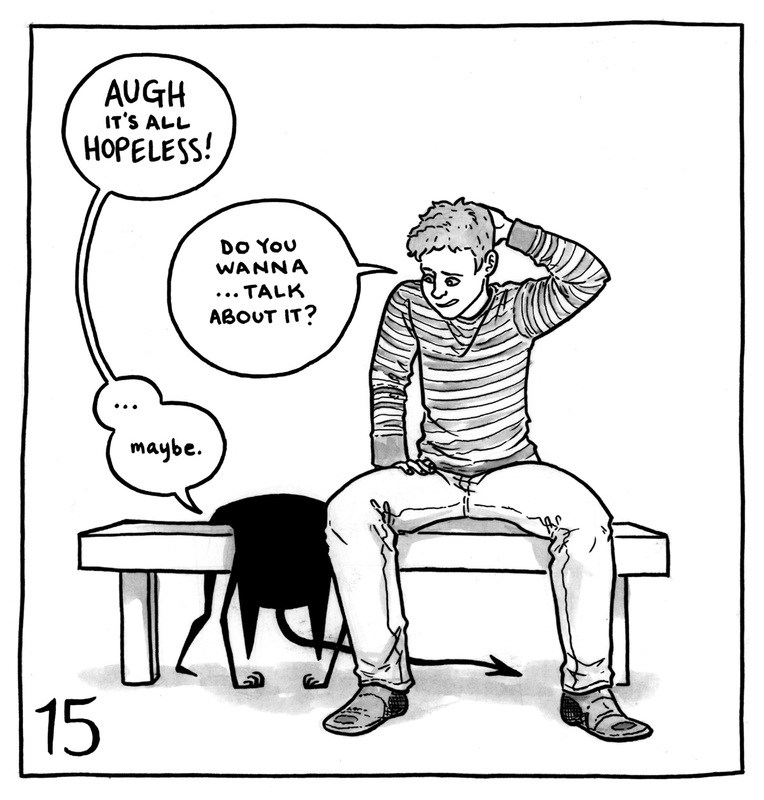 The demon asks, "What's going to happen to me? After all this is over." The demon is wagging its finger at Lucy while sitting on the edge of a mirror. Lucy is shaving the right side of her head. The demon says, "A REAL woman wouldn't--" Lucy says, "Can it. We agreed gender was above your pay grade." Lucy stands atop a large pillar, while her demon sits on the edge. 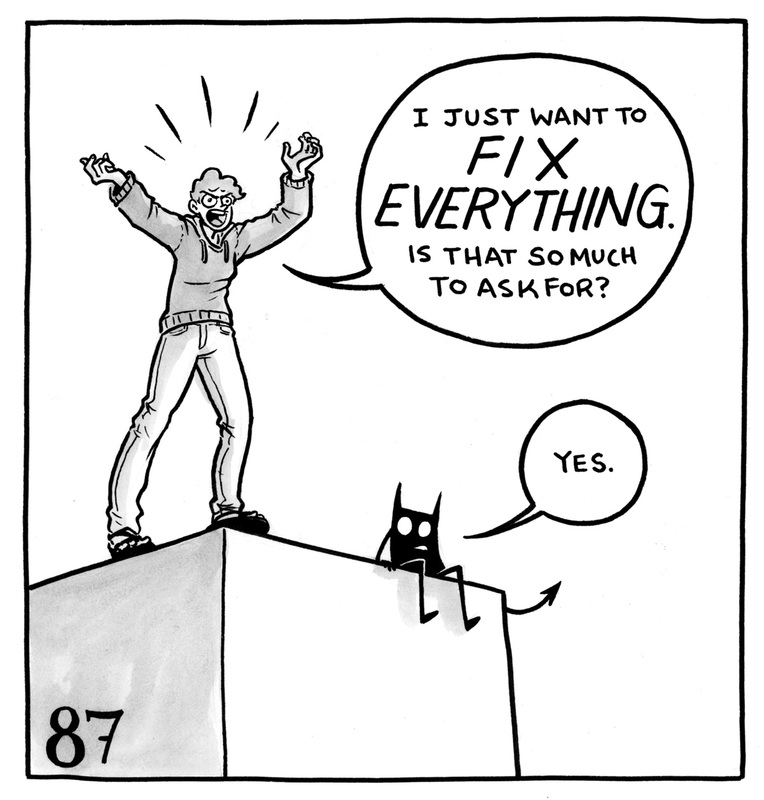 Lucy says, "I just want to FIX EVERYTHING. Is that so much to ask for?" Her demon replies, "Yes." Lucy is walking on a tightrope while her demon stands on one of the platforms. 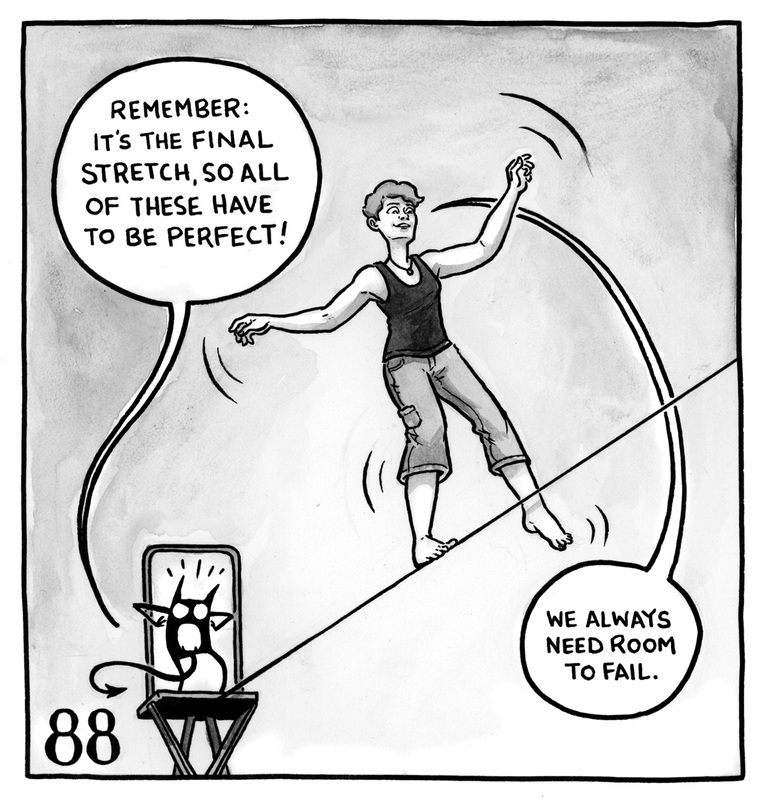 The demon says, "Remember: it's the final stretch, so all of these have to be perfect!" Lucy replies, "We always need room to fail." Lucy holds her demon by the ear as it kicks and flails. Lucy says, "Look, you can't use fear to protect me from everything." Her demon retorts, "Oh yeah?! Just you watch me." The demon sits on top of a grand piano suspended upside down over the top of Lucy. The demon says, "If you worry hard enough this will go away." Lucy says, "Okay but what if I just go stand over there instead?" The demon stands on a dock next to Lucy. The demon says, "Do you have ANY IDEA how lucky you are? You don't DESERVE to complain." Lucy says, "Pain is not a race." Lucy holds a comic book up while the demon jumps to get it. The demon says, "But work is self care!" Lucy replies, "Nope. I'm cutting you off." Lucy walks away while her demon yells at her. "FINE. What has your 'work' ever done anyway?" Lucy says, "Hopefully far more than we know." 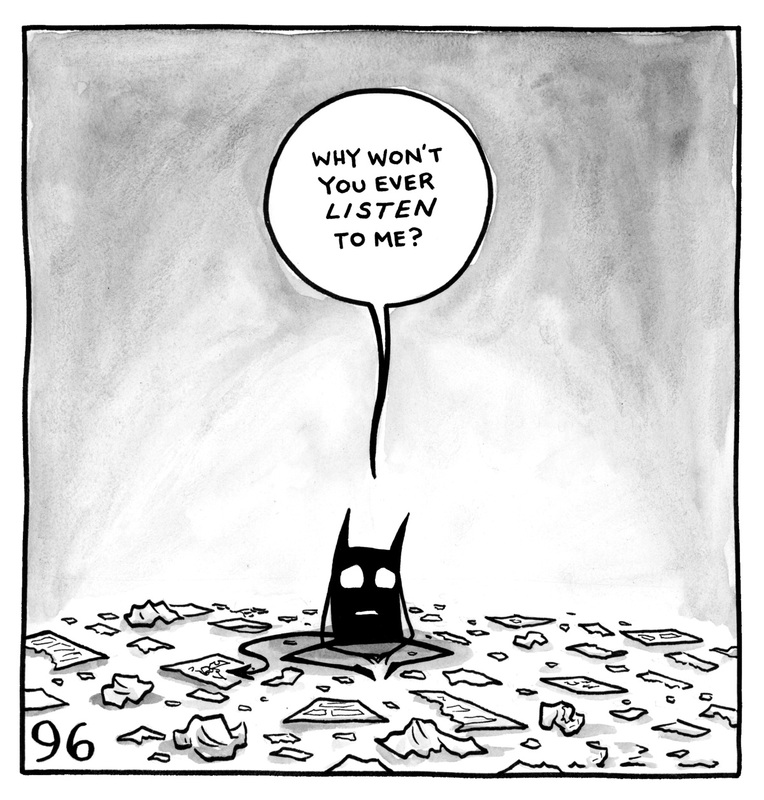 The demon starts tearing apart comic pages, yelling, "You think art can make a difference? 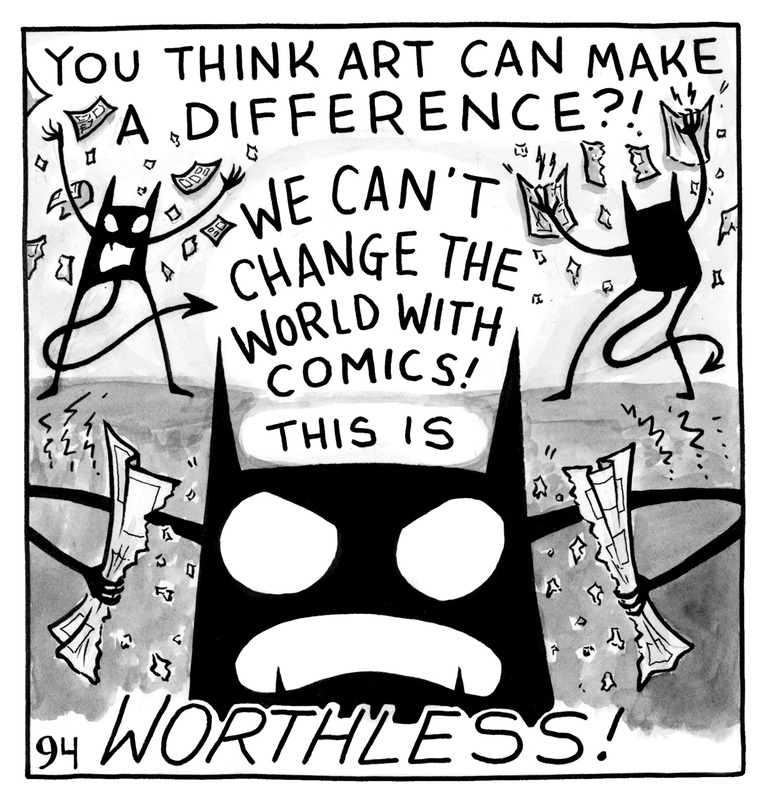 We can't change the world with comics! This is WORTHLESS!" The demon stands among the wreckage, shredded paper, and torn pages, shaking and panting. The demon slumps down. "Why won't you ever LISTEN to me?" it asks plaintively. Lucy comes and sits next to it. She says, "Oh, buddy. I've been listening every day for the last three months. We all have." The demon says, "Huh?" Lucy guides the demon away. She says, "Come on. I wanna show you something." 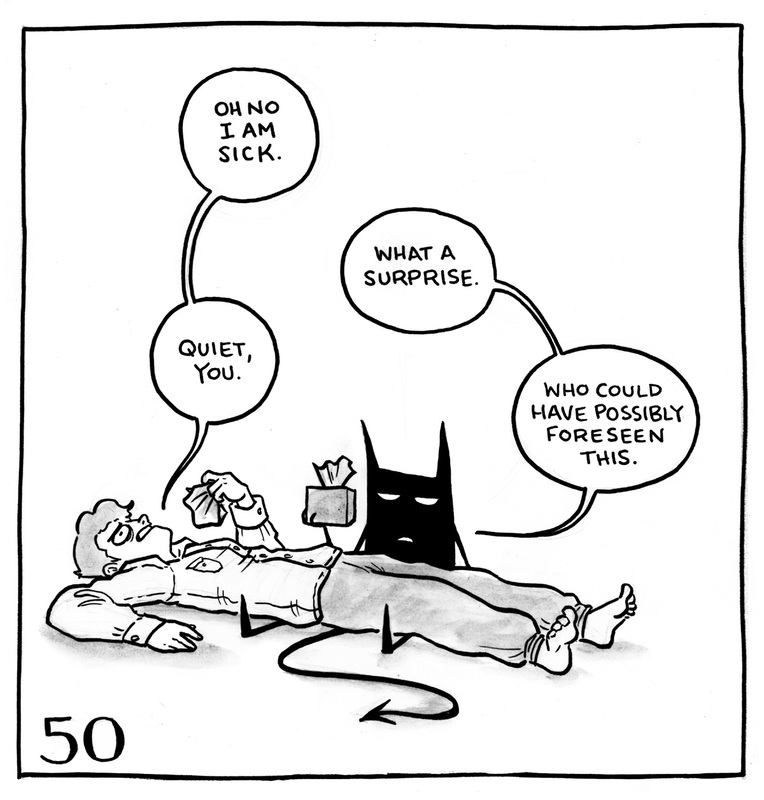 The demon says, "I hate surprises." Lucy opens a door leading outside. "Just trust me," she says. The demon looks out at the front yard. A crowd of people stand there, all age groups, all types of people, all holding their very own smiling demons.